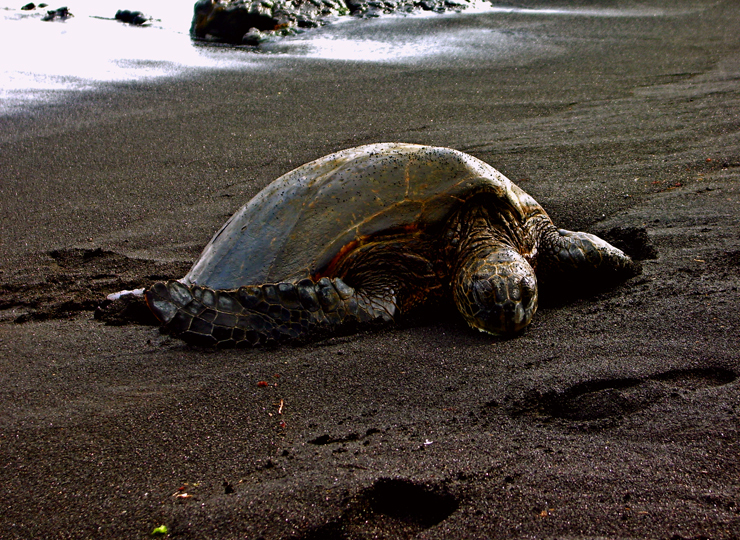 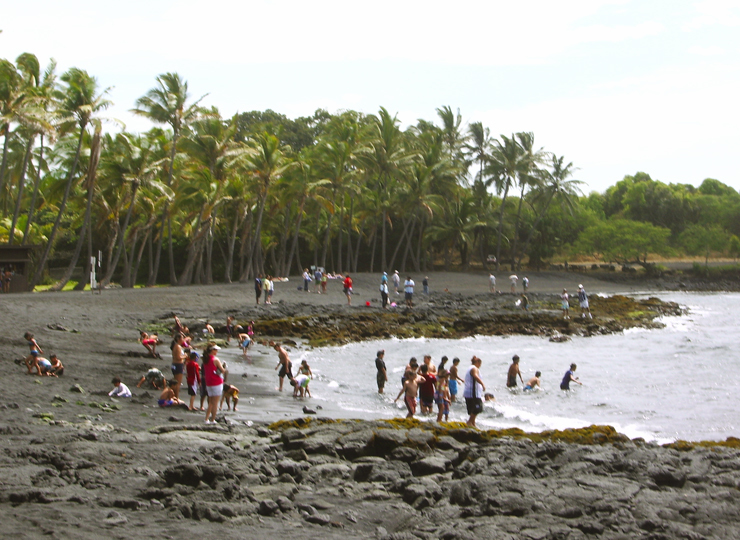 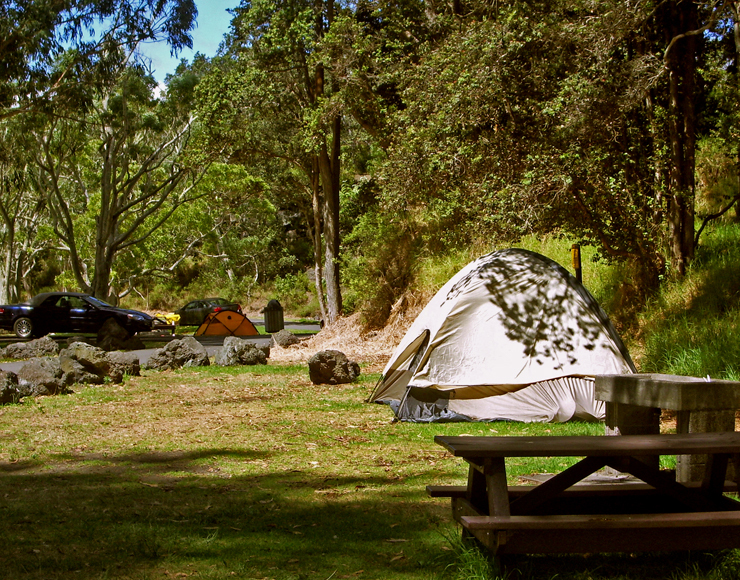 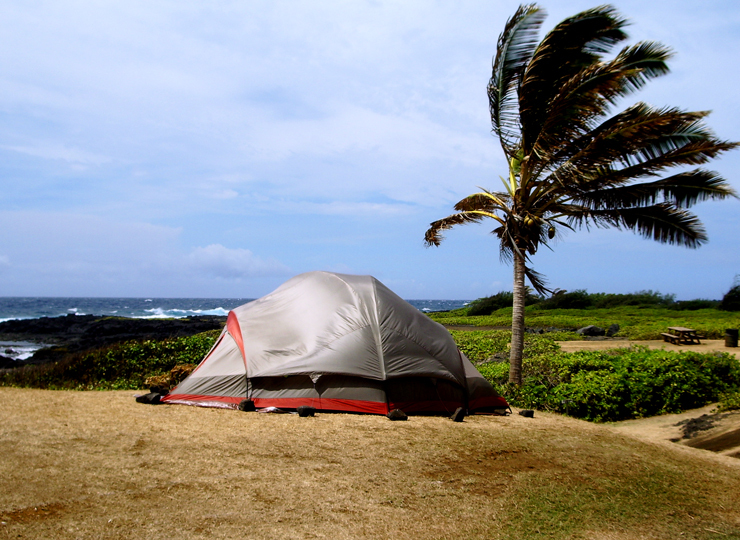 Camping, picnicking, snorkeling and hiking, Samuel Spencer Beach Park is the perfect headquarters for exploring the Kohala Coast. 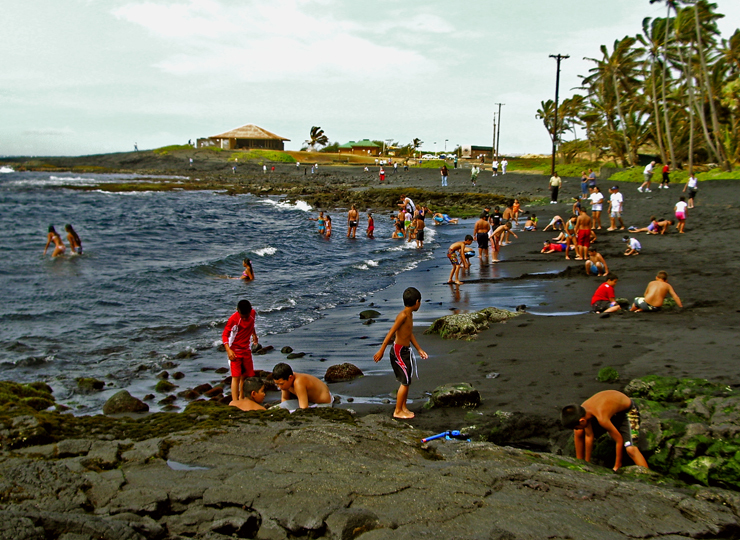 It is also a great place to take children, or those who are not used to swimming in the open ocean, swimming. 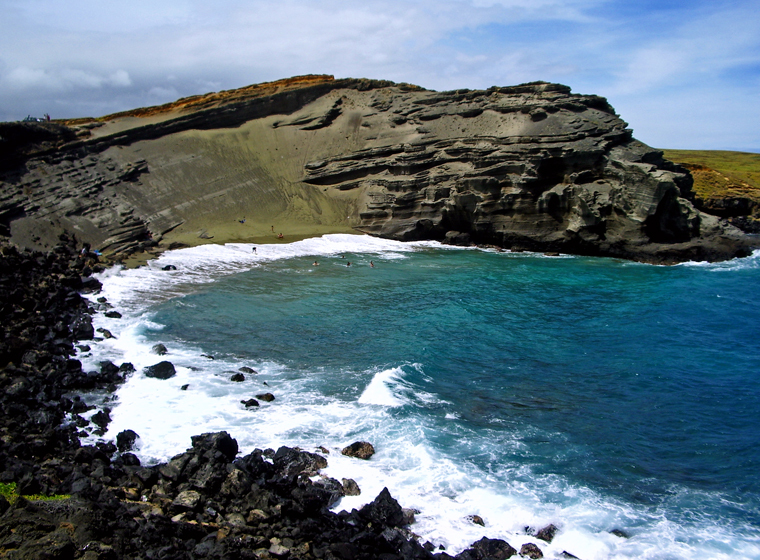 The swimming is very protected and calm, even in the highest of surf, although the water is a little murky for snorkeling. 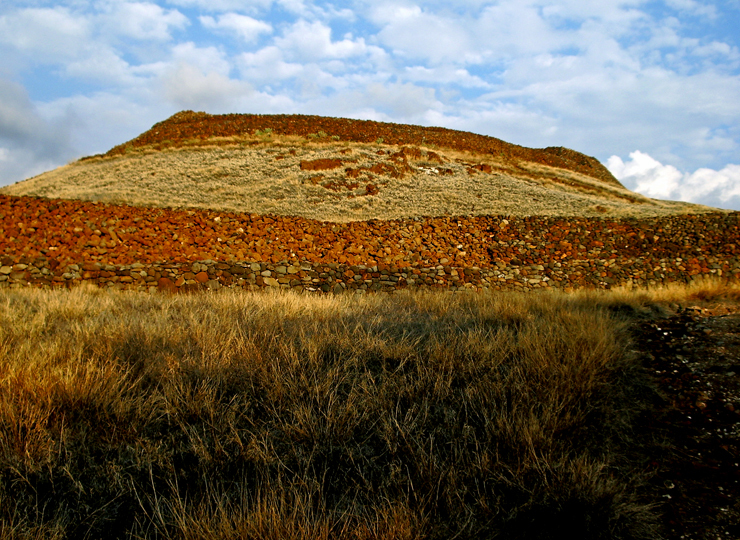 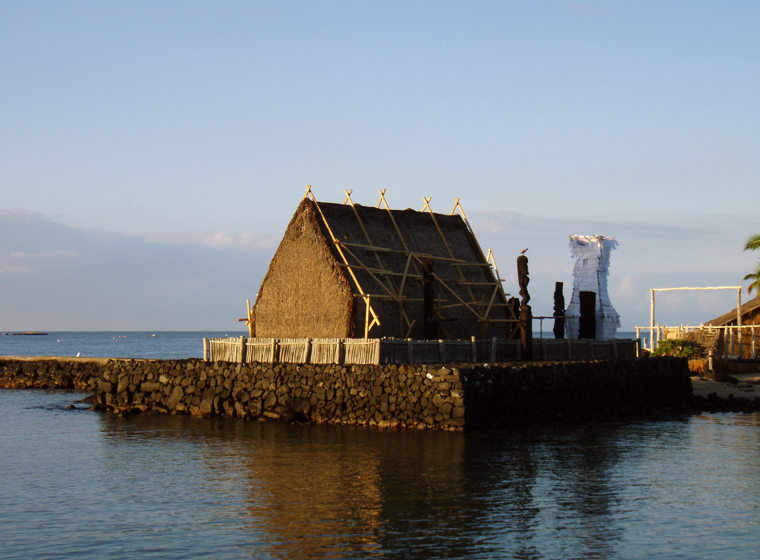 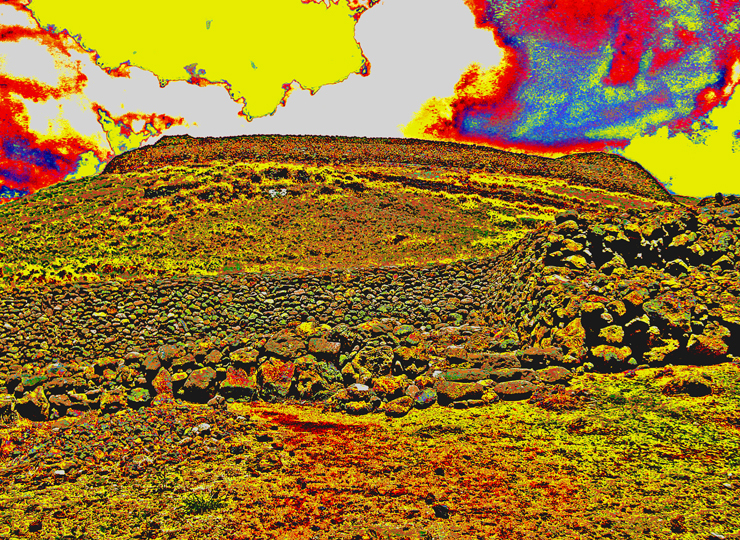 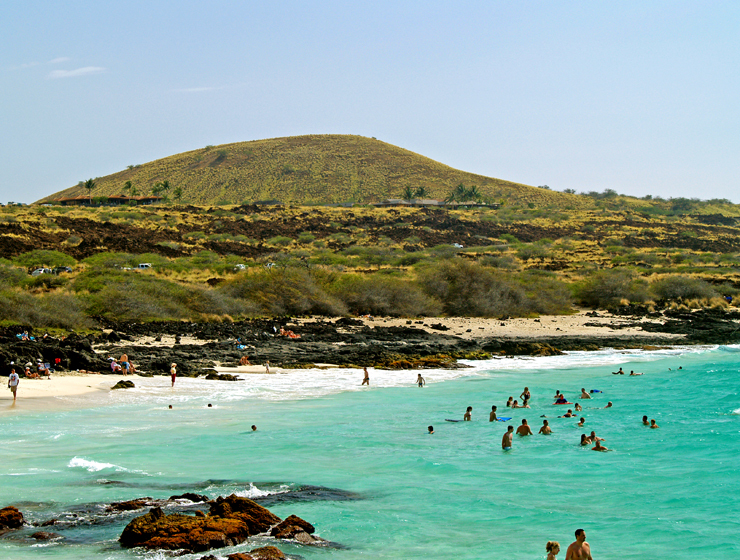 The famous, storied Pu’ukohola Heiau, the largest stone structure in Polynesia, is within walking distance of the park. 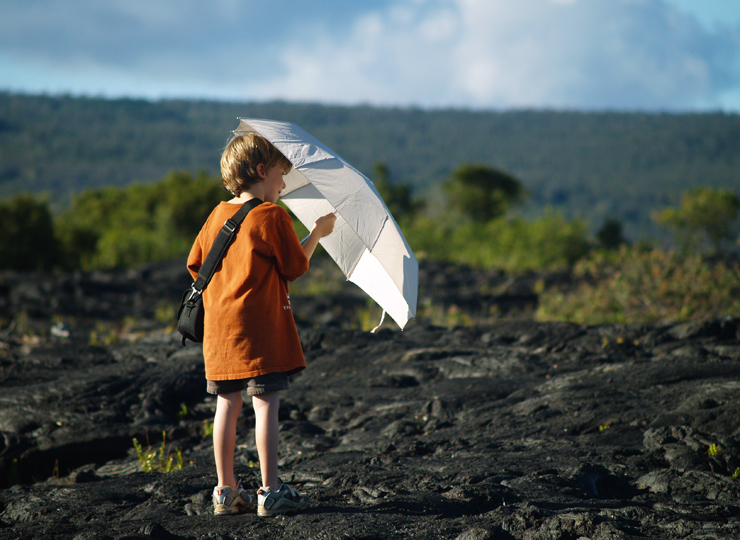 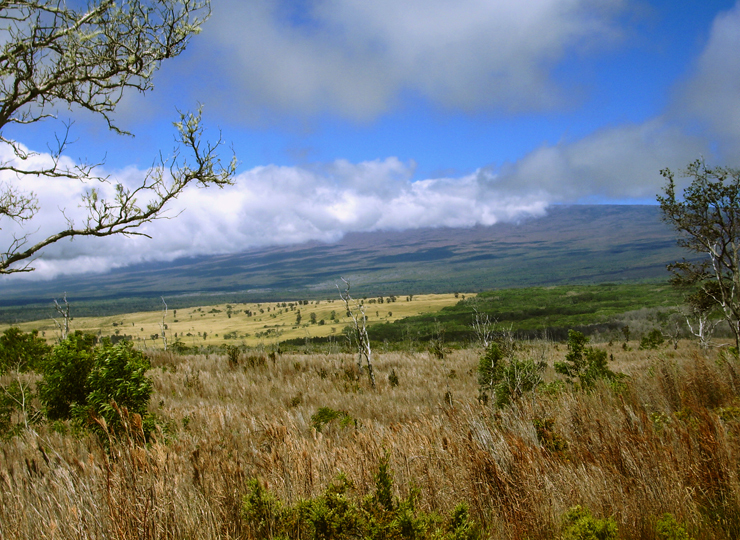 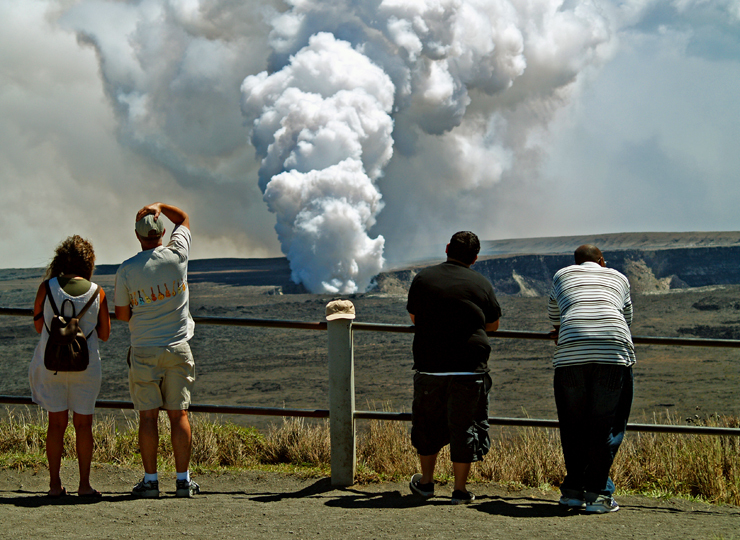 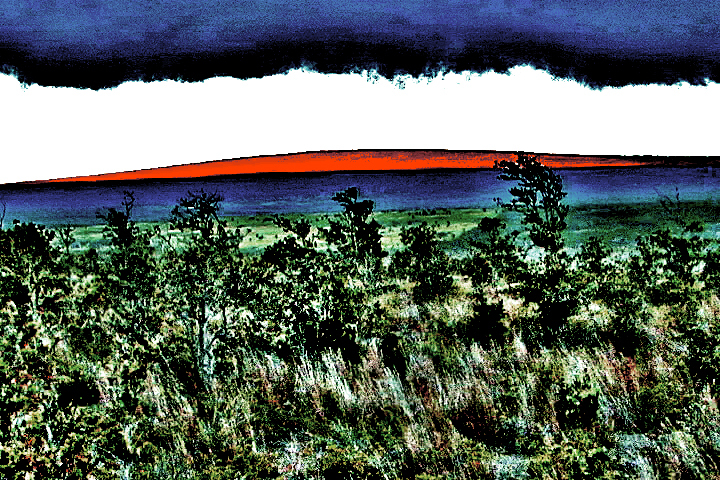 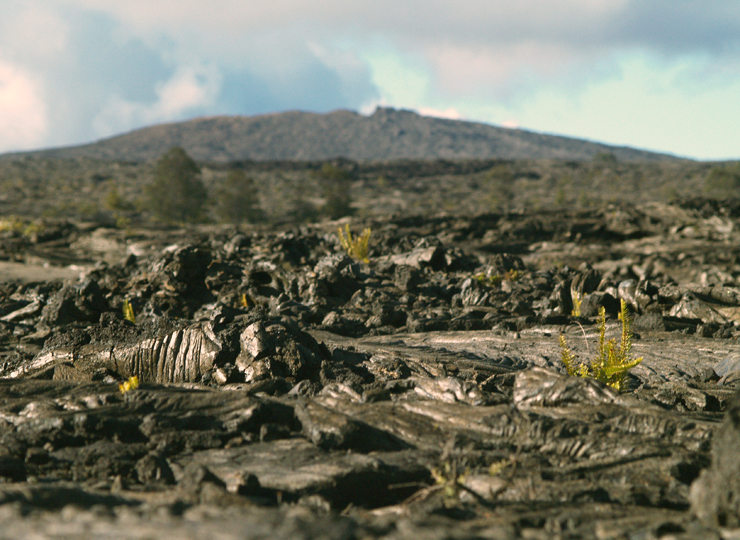 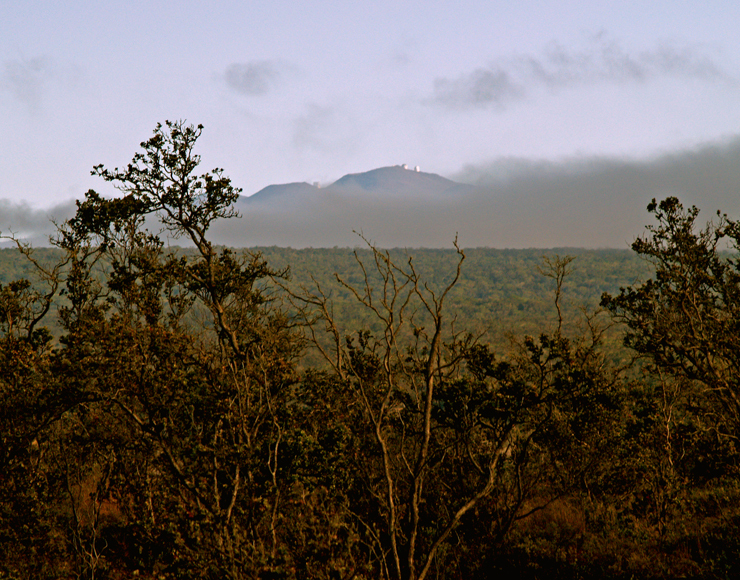 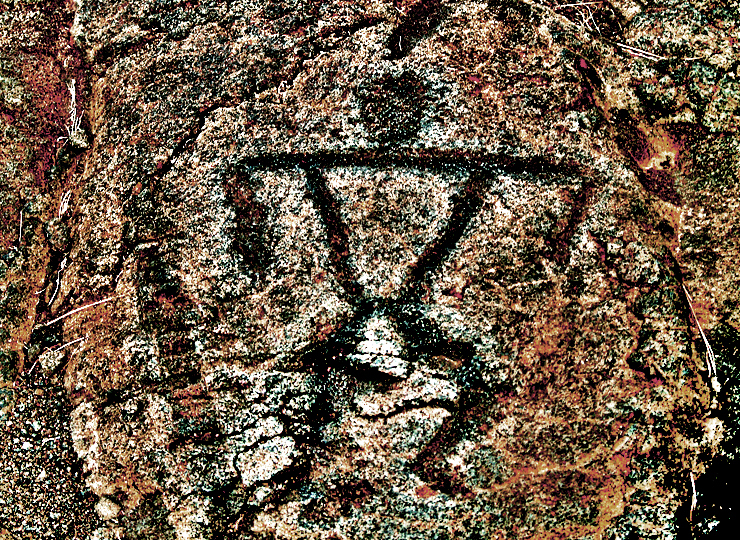 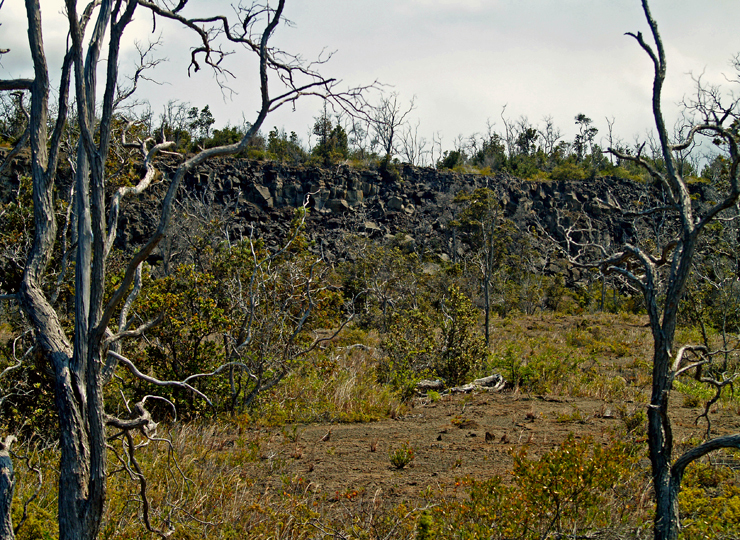 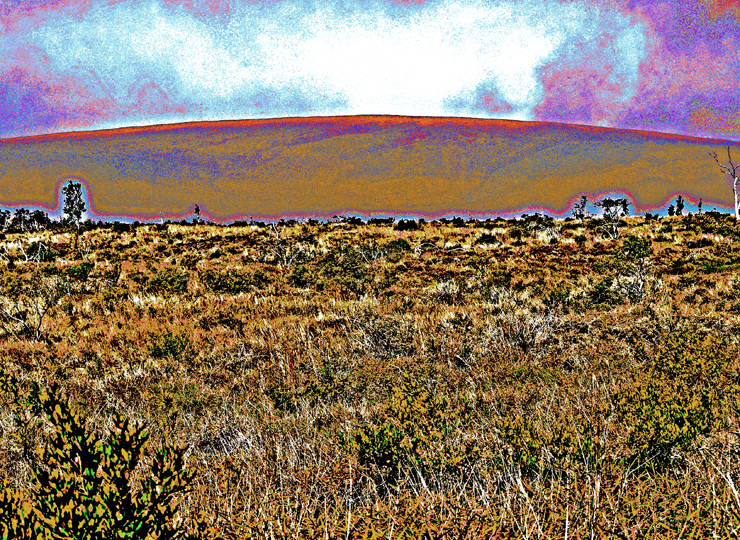 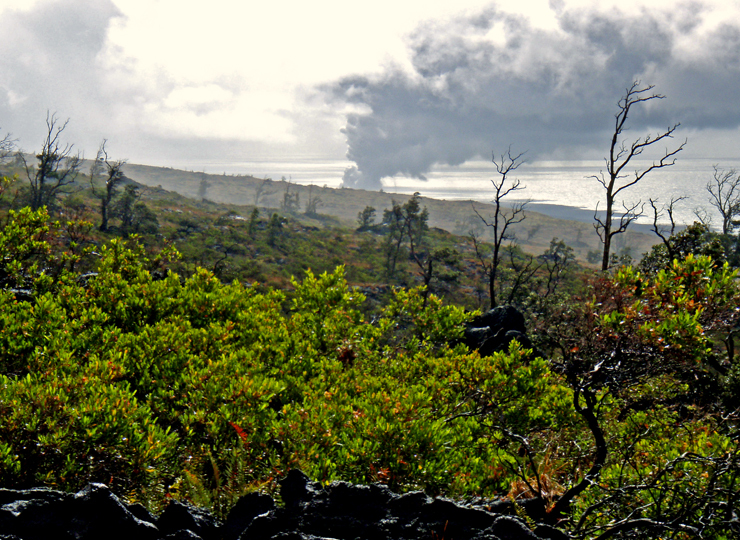 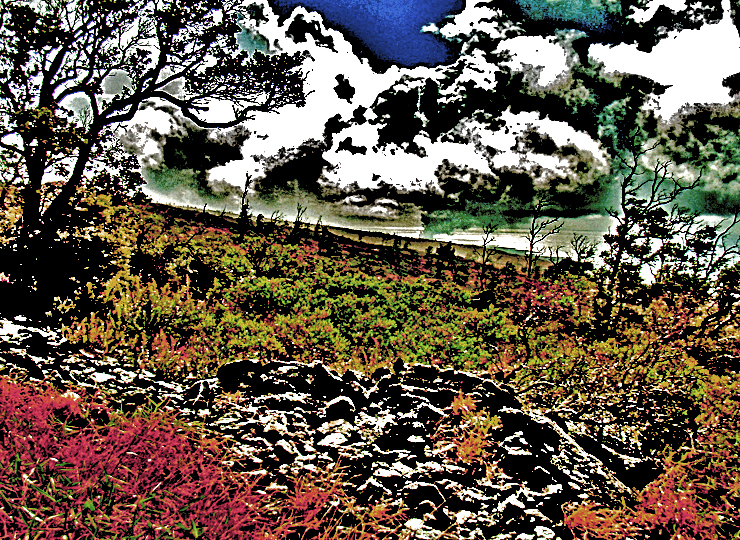 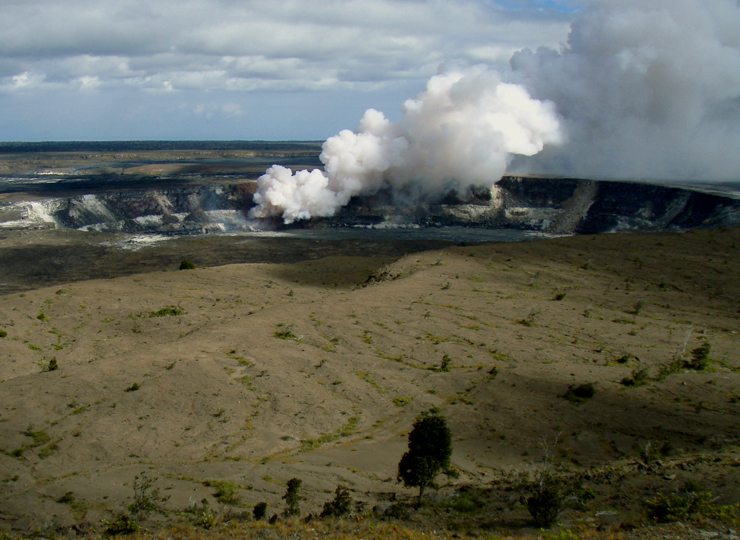 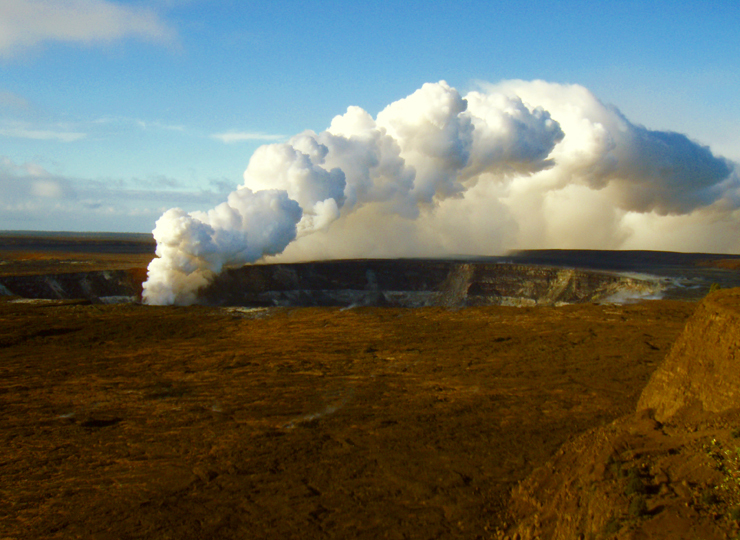 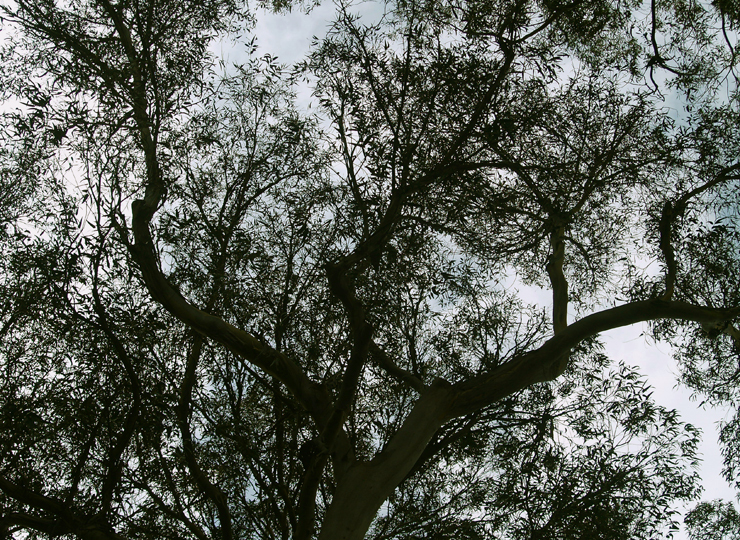 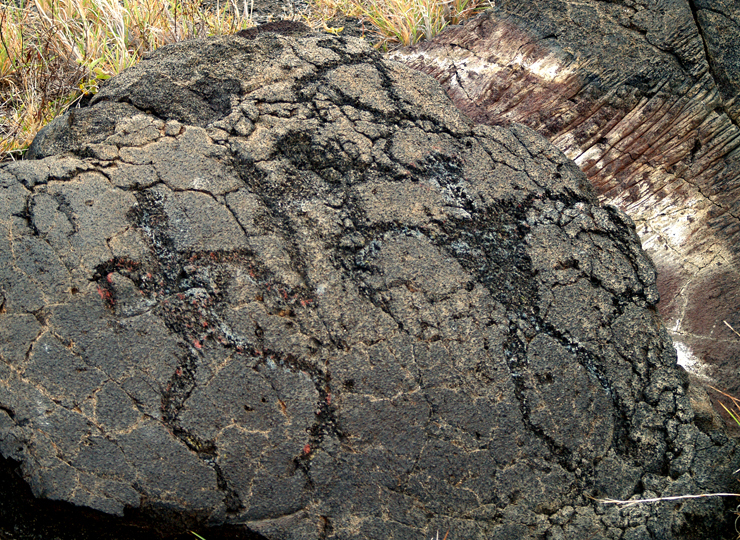 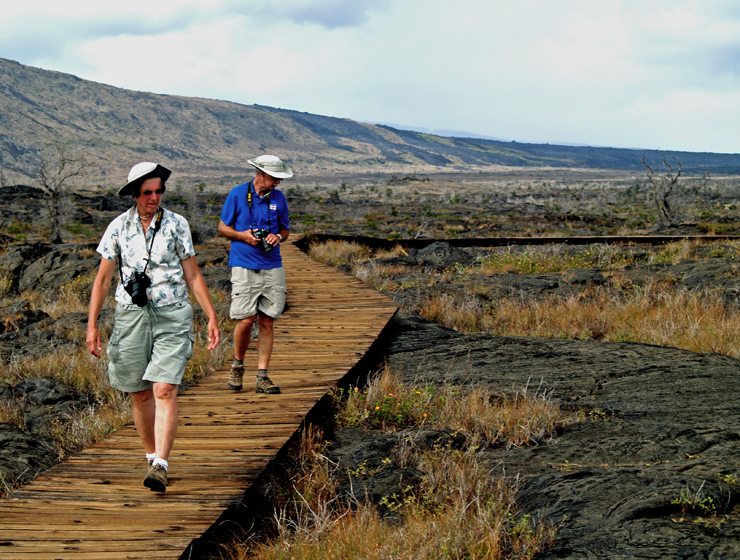 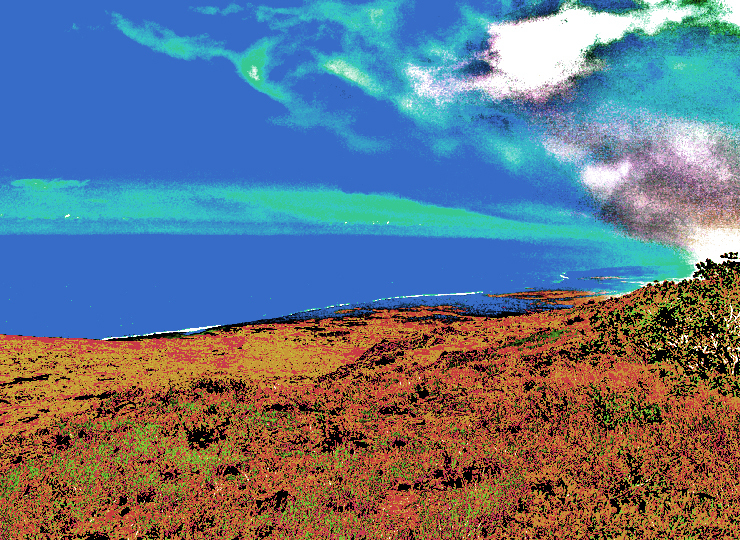 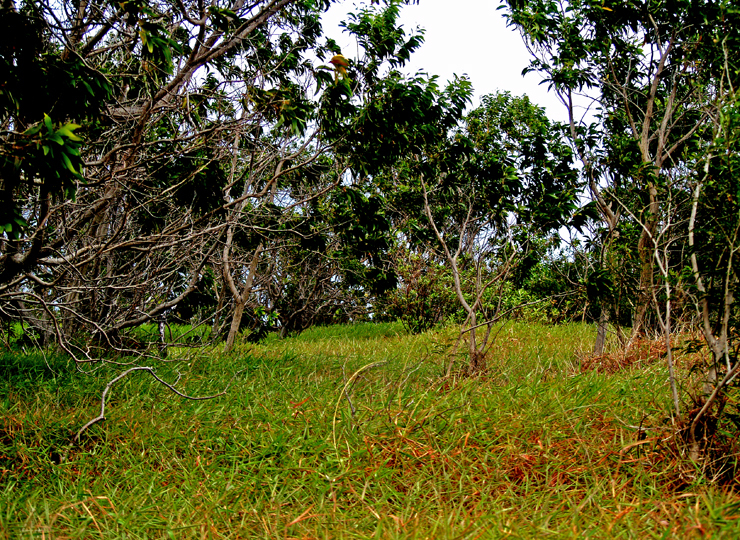 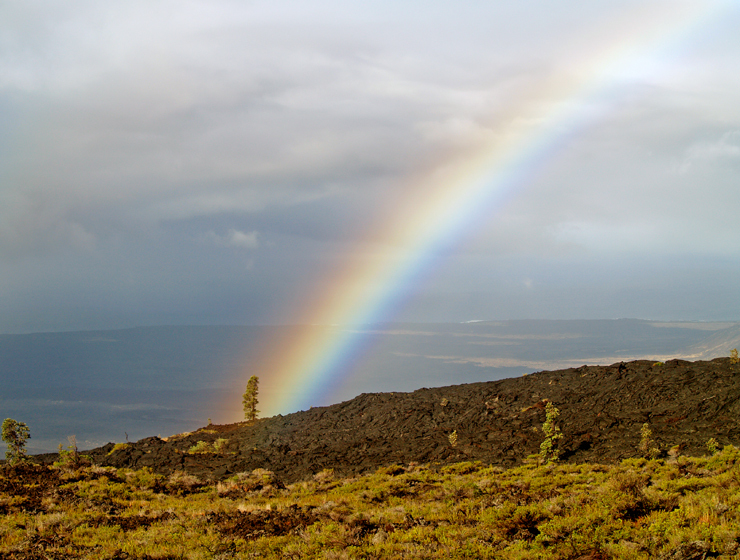 For more information about Pu’ukohola National Historic Park, please go here. 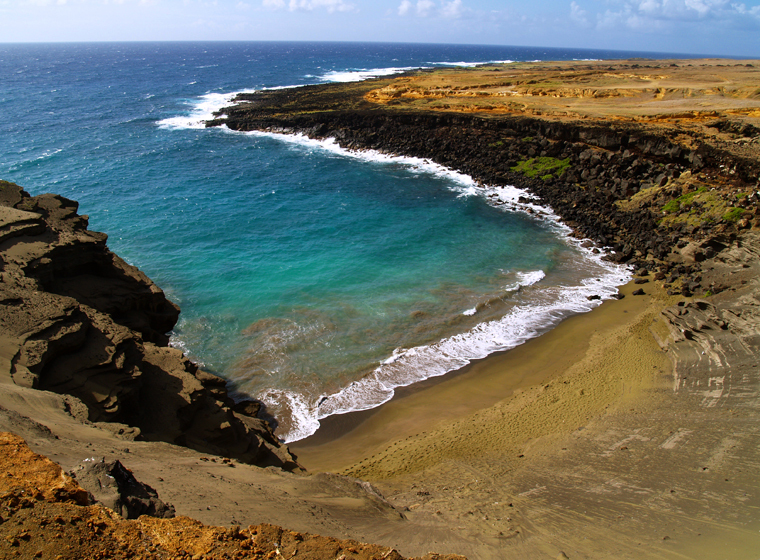 The Hawaiian name for the beach is ʻŌhai ʻula, but it was renamed to honor Samuel M. Spencer, a Hawaii County Judge, postmaster and one time Director of the Hawaii County. 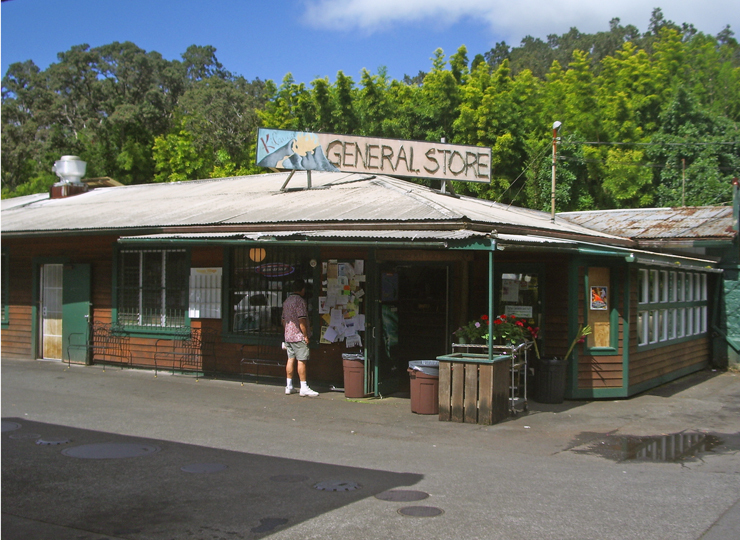 Board of Supervisors. 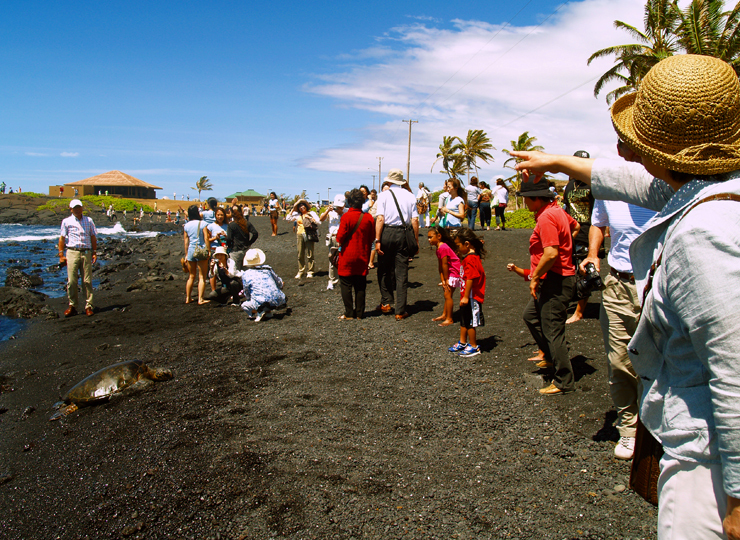 Of interest, the beach is the terminus of one section of the Southern Cross Submarine Communications cable that links the Big Island with the rest of the world. 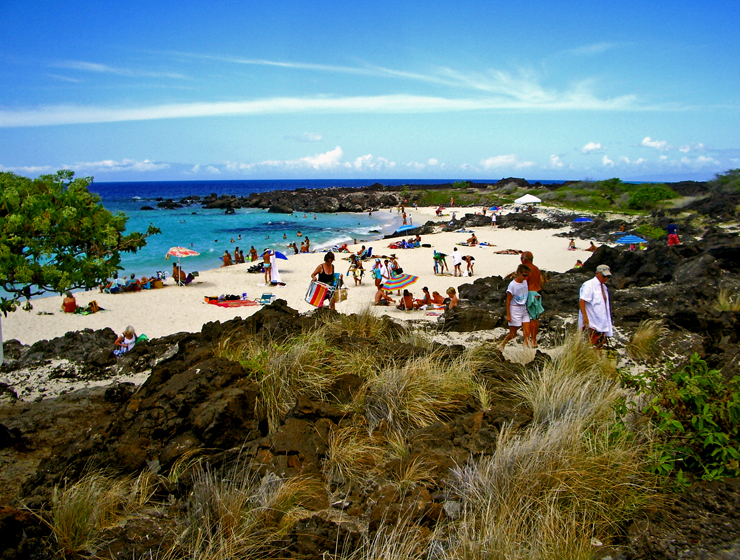 Entrance to Spencer Beach Park is at the same turn-off from the Akoni Pule Highway (Highway 270) as Pu’ukohola National Historic Park, between the 2 and 3 mile marker. 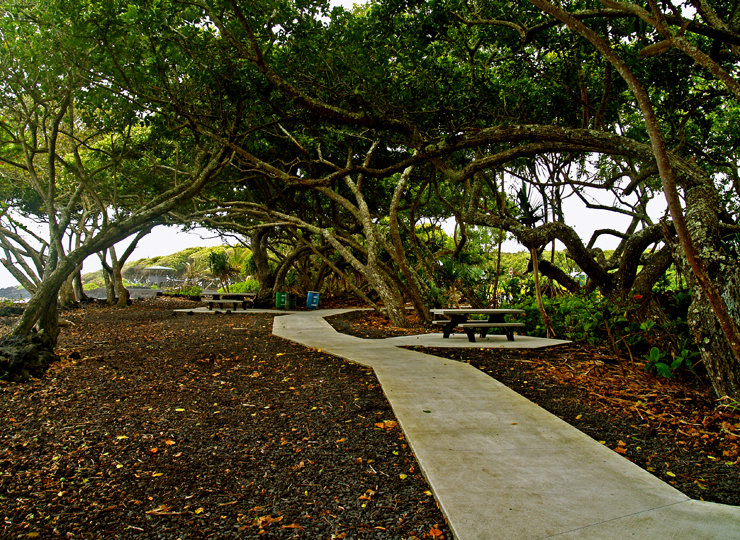 Facilities at Spencer Beach Park include a large pavilion (with electrical outlets), restrooms, drinking water, picnic tables, barbecues, beach volleyball, basketball and camping (by permit). 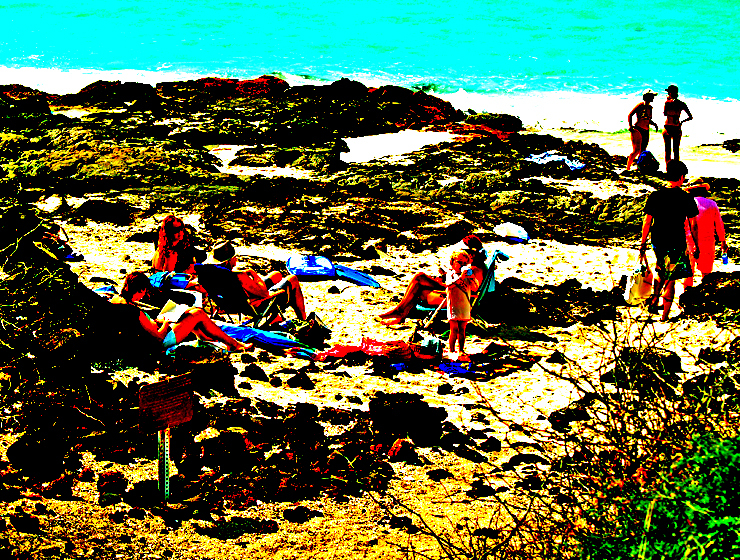 Lifeguards are present everyday except state holidays. 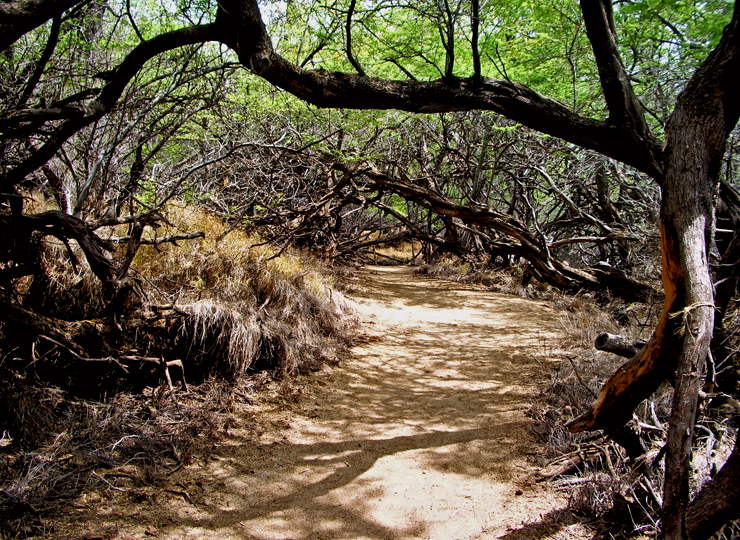 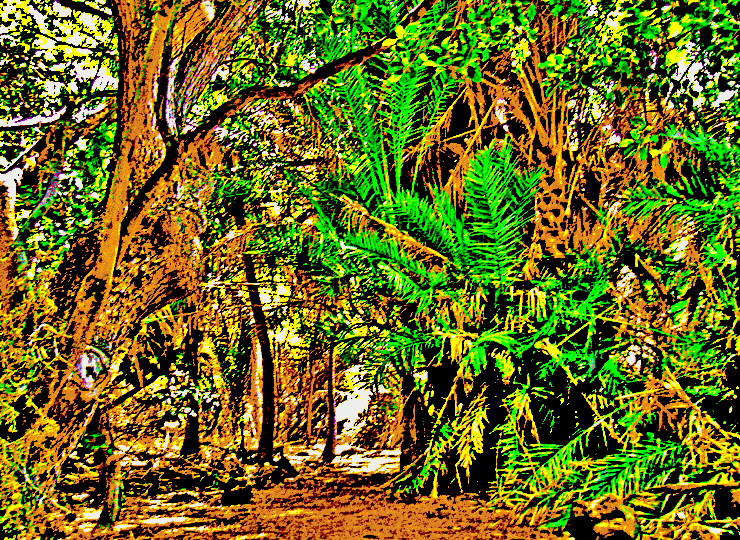 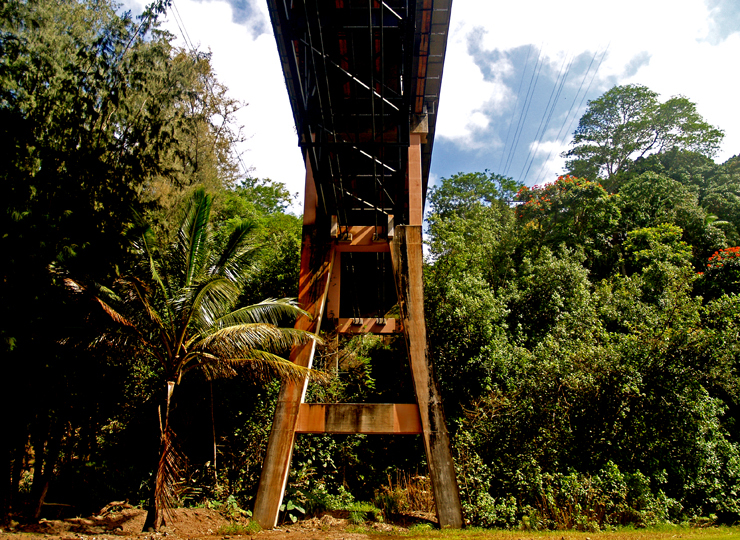 The Ala Kahakai Trail goes about 3 miles south from Spencer to Hapuna Beach and makes a lovely hike. 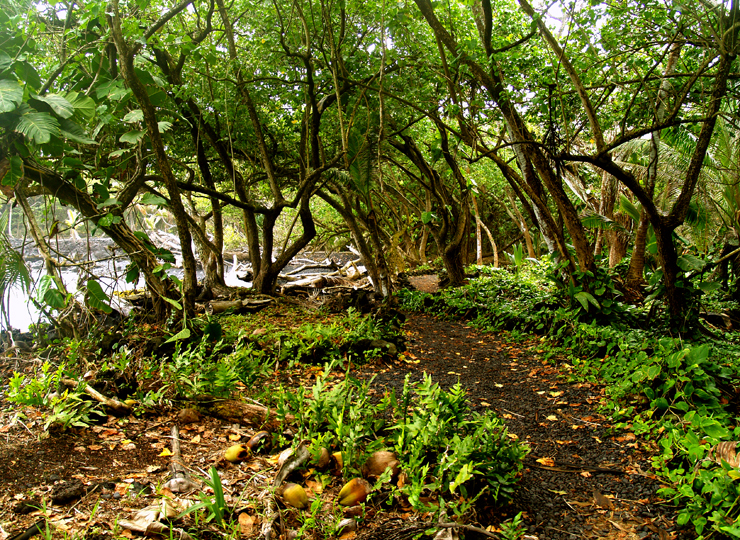 About 10 minutes along the trail from Spencer Beach Park, it passes across Mau’umae Beach. 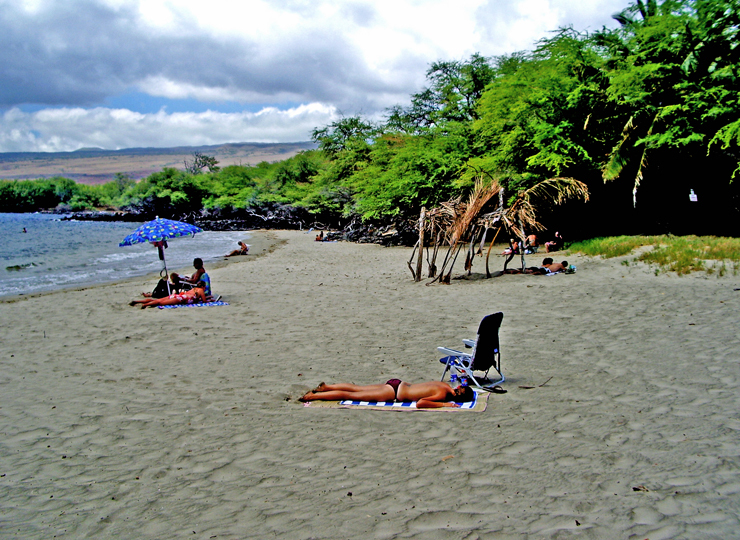 If you are looking to tan-in those pesky bikini lines, Mau’umae Beach is a little known gem that is secluded and private and sometimes frequented by the “clothing optional crowd”. 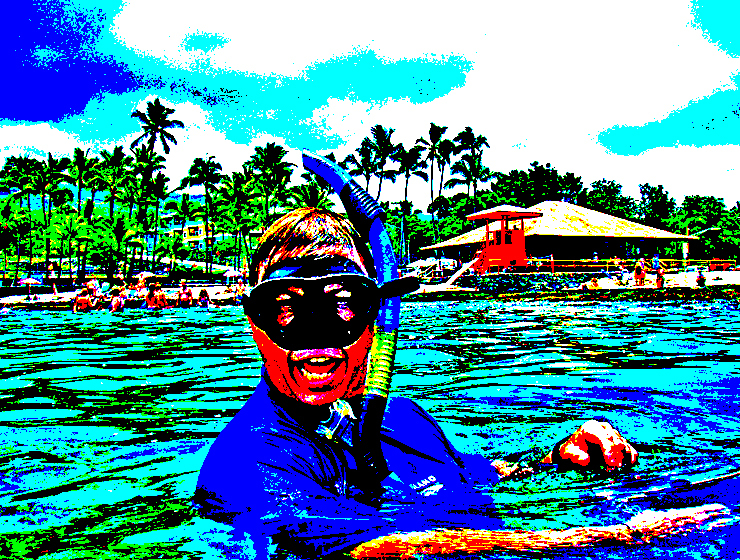 The swimming is great, but the water is a little cloudy for snorkeling. 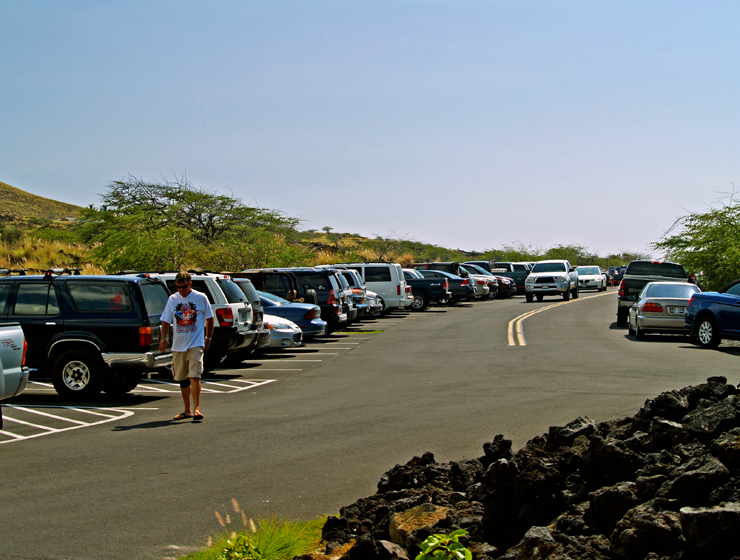 You can also reach Mau’umae Beach by stopping at the entrance to the Mauna Kea Resort to obtain a pass to drive across resort property and follow the Mauna Kea Resort Road through the entrance. 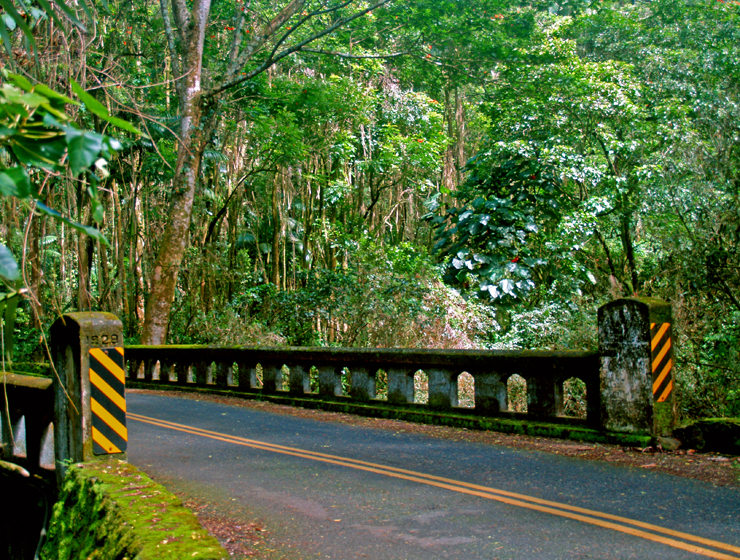 At the third intersection turn right on Kamahoi Road, cross 2 wooden bridges and park at pole # 22. 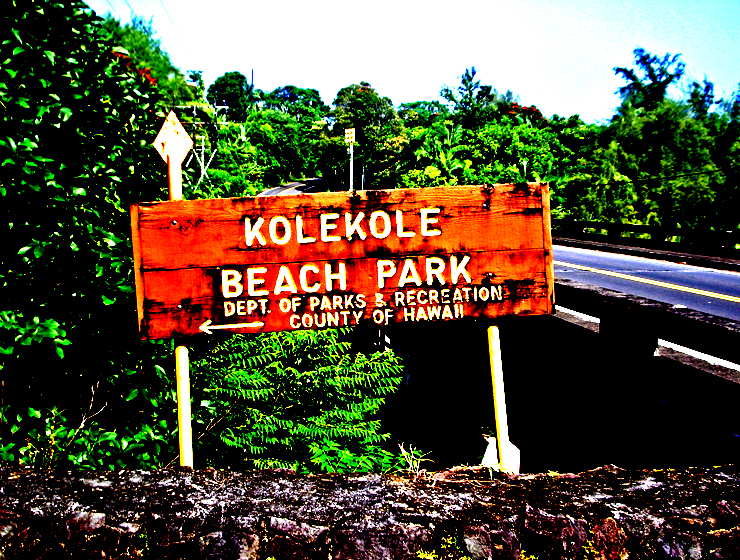 Walk 5 minutes (turn left at the water) to the beach. 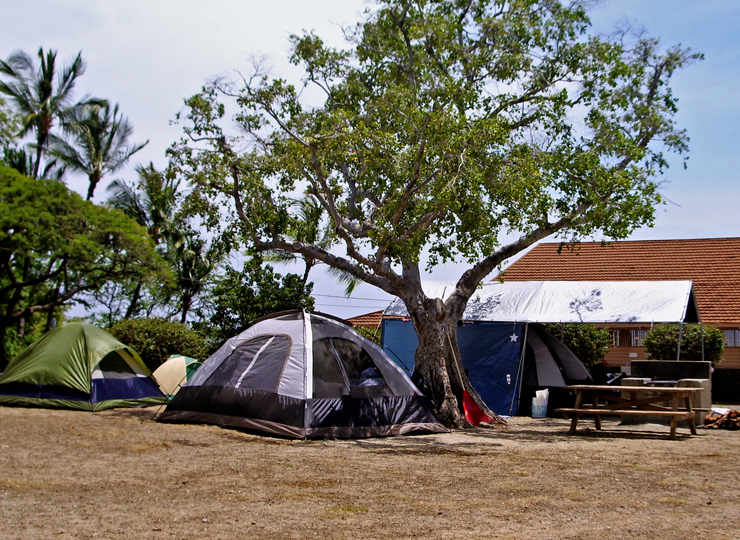 There are no facilities at Mau’umae, but it is immediately adjacent to the Mauna Kea Resort and only a 10 minute walk from the facilities at Spencer Beach State Park. 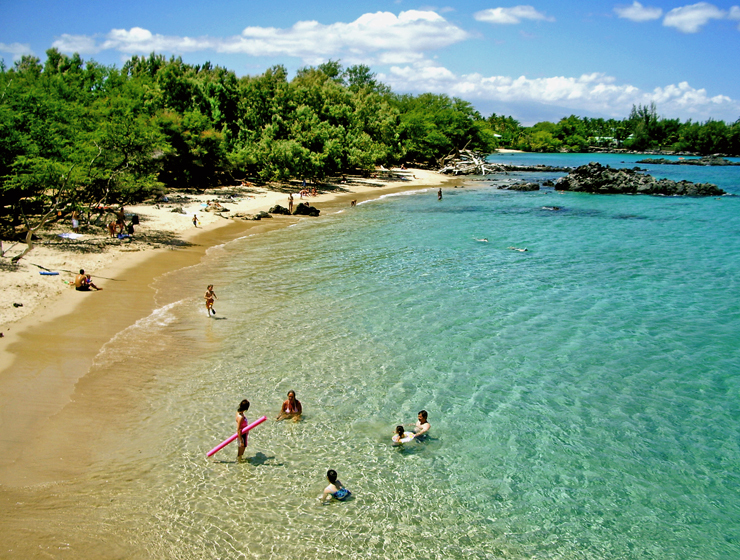 The site of Kona’s newest beach park, this is a lovely white sand beach, Kua Bay, is also called Manini’owali. 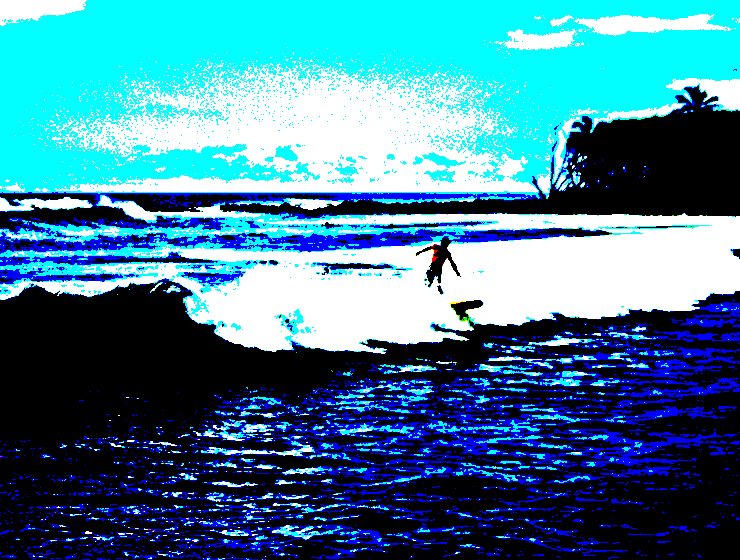 Although there is no shade to speak of, but the the swimming and boogie boarding in the crystalline waters is primo, as is cliff-jumping from the rocks offshore. 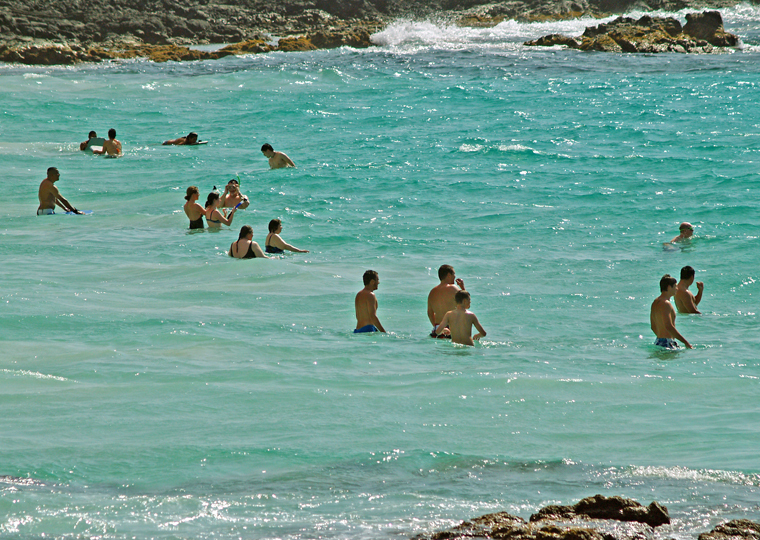 Snorkeling the clear, turquoise ocean along the rocks to the north is excellent until the surf or wind picks up. 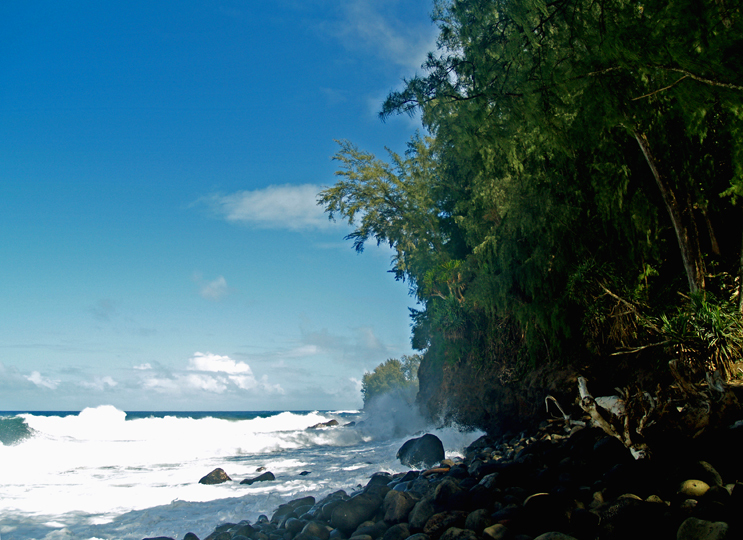 Strong currents and large waves call for respect, here; so if the surf is up, don’t go in. 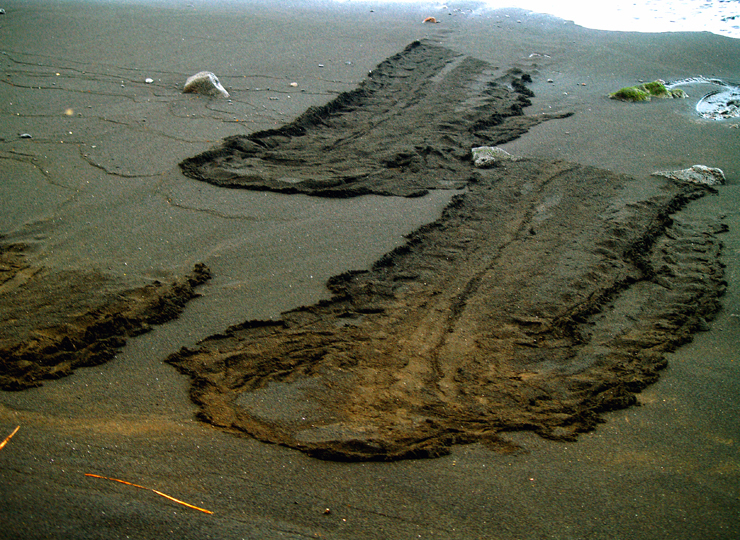 Also, sometimes in winter the surf removes the sand to offshore, leaving a rocky shelf that is less fun to frolic on than the sandy beach. 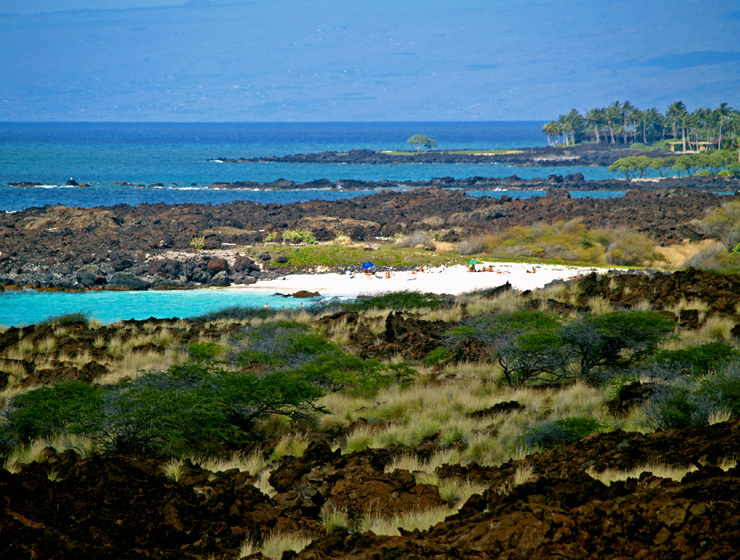 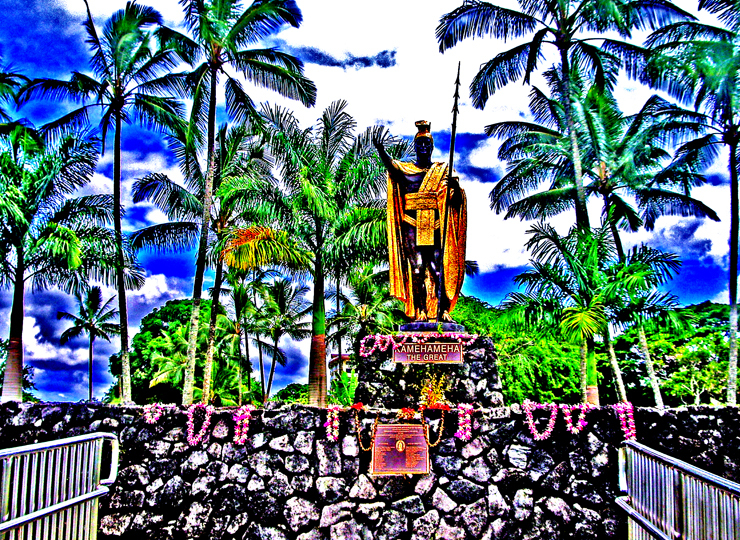 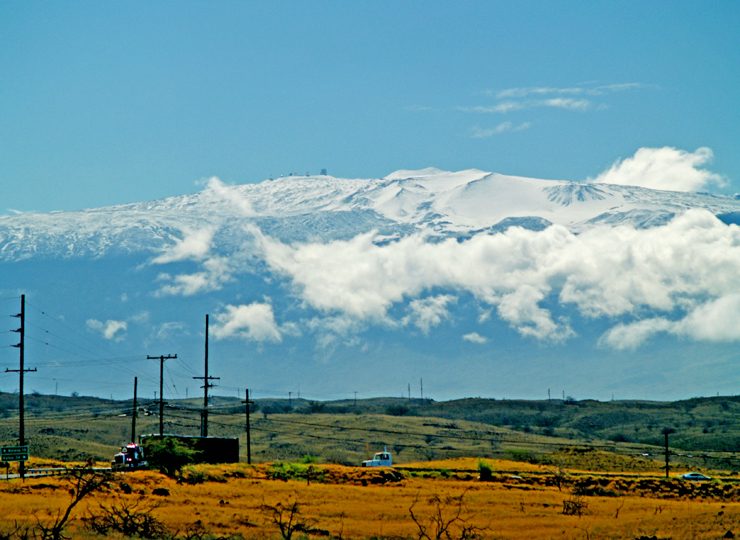 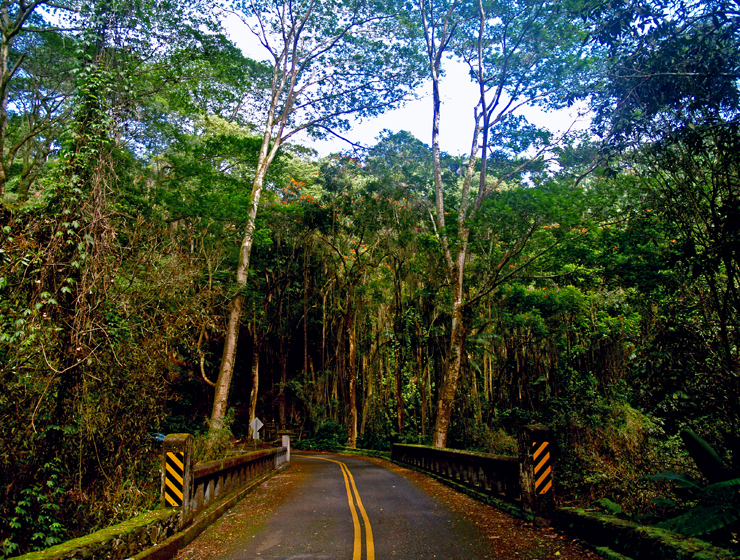 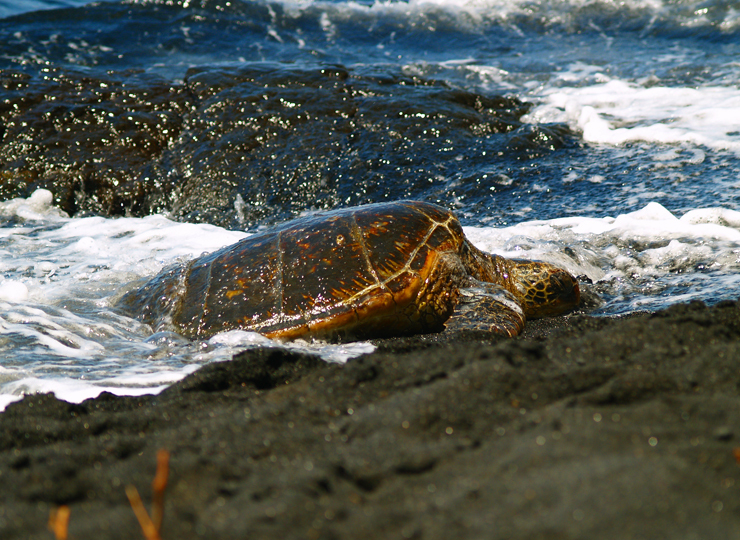 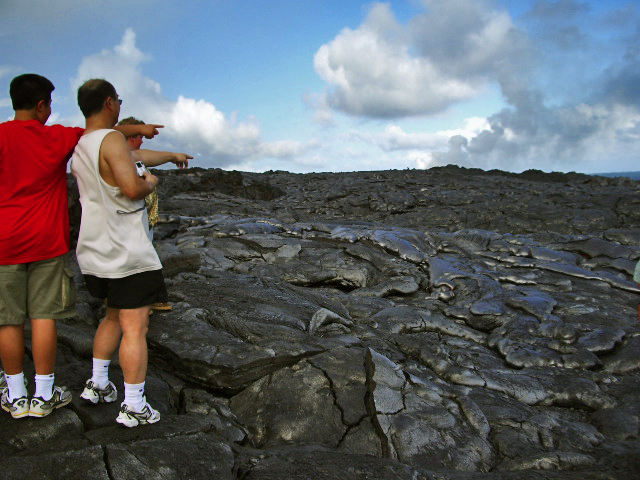 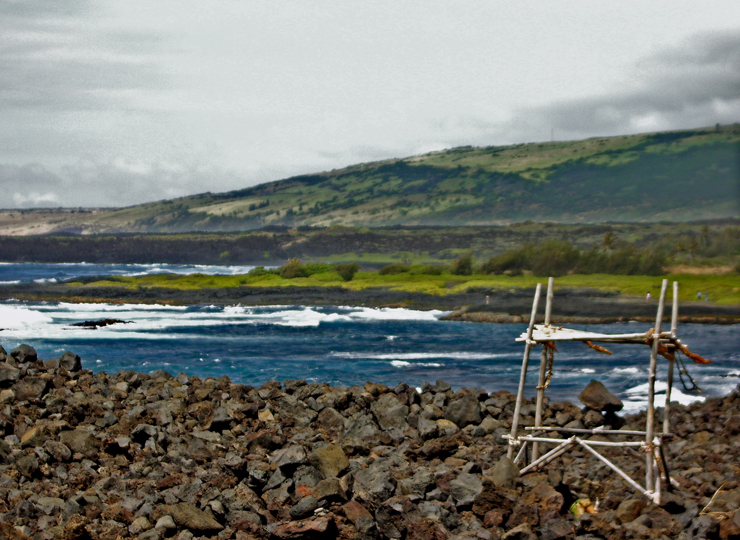 Kua Bay access road can be found north of Kailua Kona between mile markers 88 and 89 on the Queen Ka’ahumanu Highway. 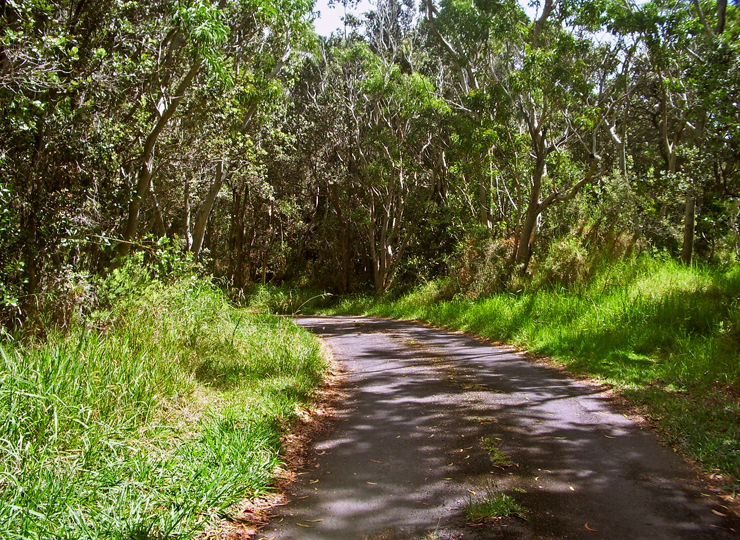 The turn is directly across the highway from the better-signed turn to the Veterans Cemetery. 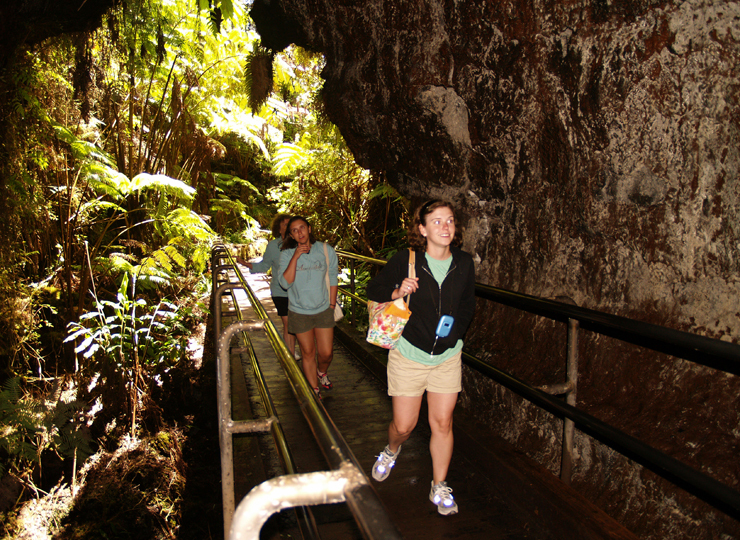 Remember that although the park is closed and the gate is locked on Wednesdays, you can still hike in, although it’s about a mile. 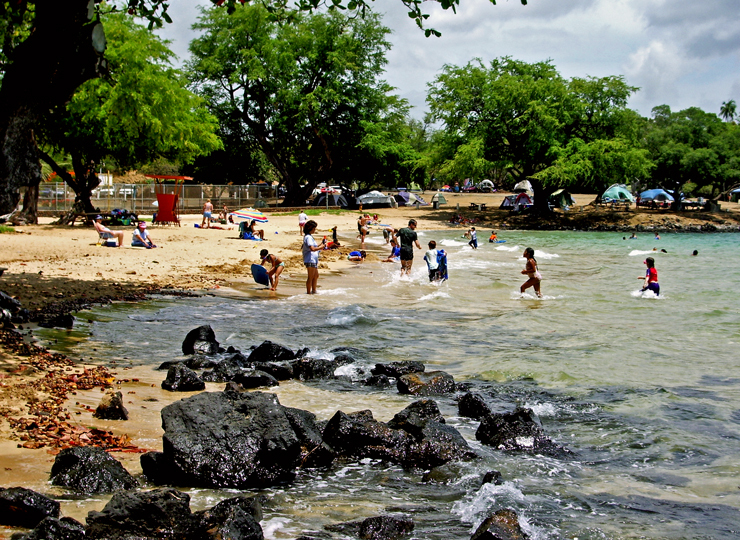 There are no lifeguards at Kua Bay, so you swim at your own risk. 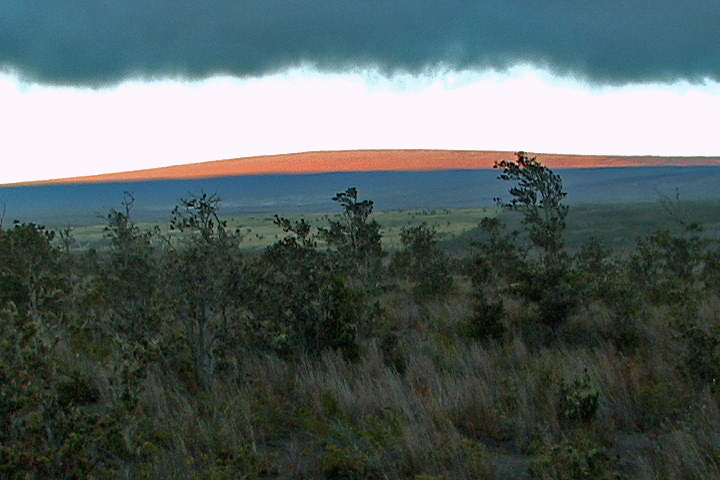 Also, there is little or no shade here, and the sun can be intense, even on a cloudy day. 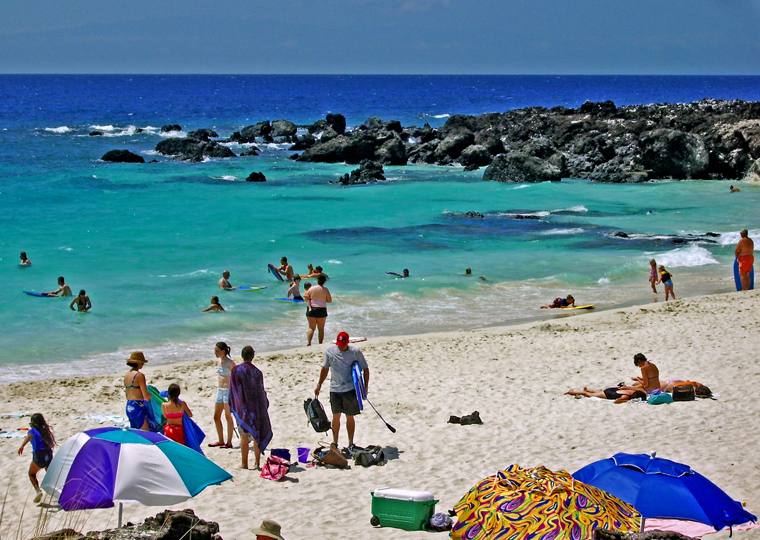 Be sure to bring lots of sunblock, a long-sleeved shirt for after sunning, sunglasses and perhaps even a beach umbrella; remember to drink more water than you think you need while on the beach. 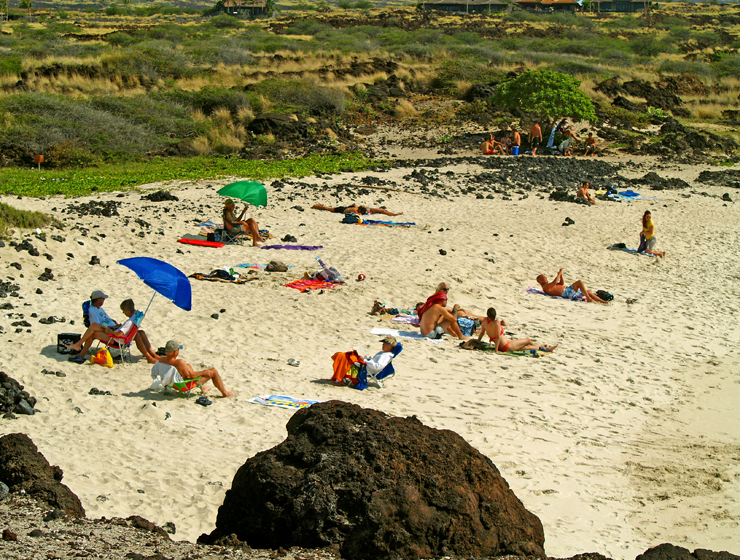 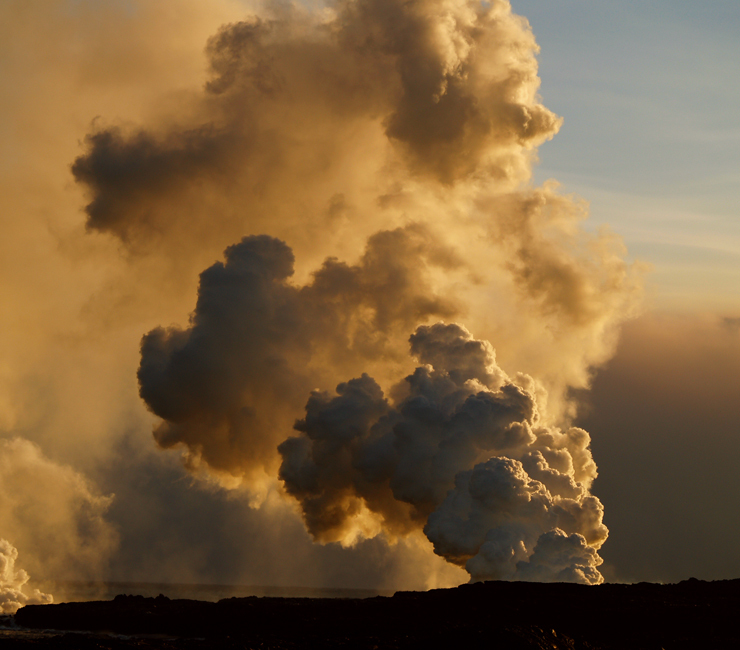 So many visitors do not understand the ferocity of the Hawaii sun and wind-up getting a vacation-ruining sunburn; don’t let that happen to you. 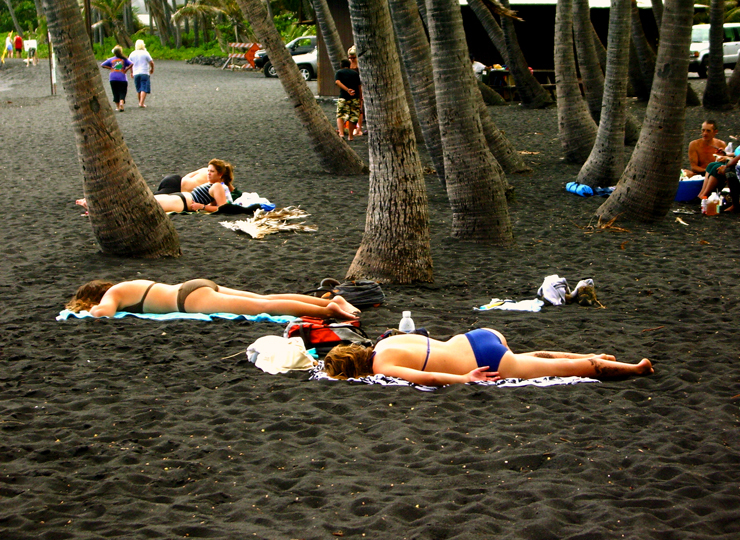 Read more about sunburn and sunblocks for Hawaii here, and about appropriate sunglasses for Hawaii, here. 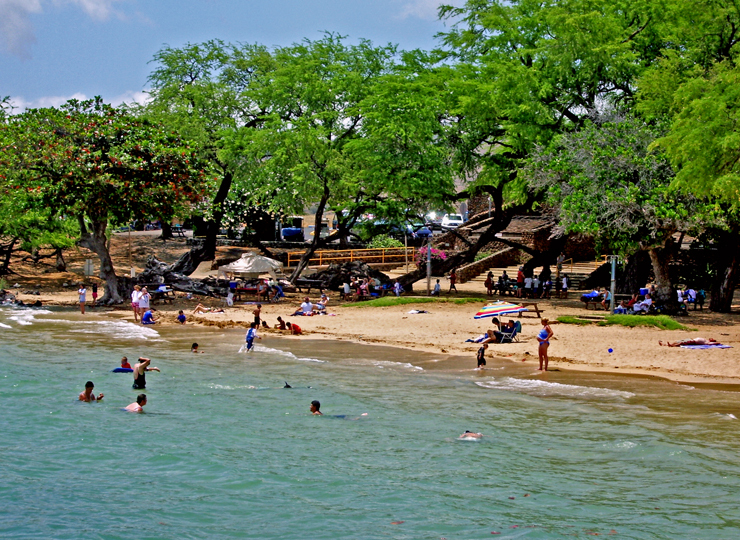 Behind the beach on the north end is a small, inviting fresh-water pool. 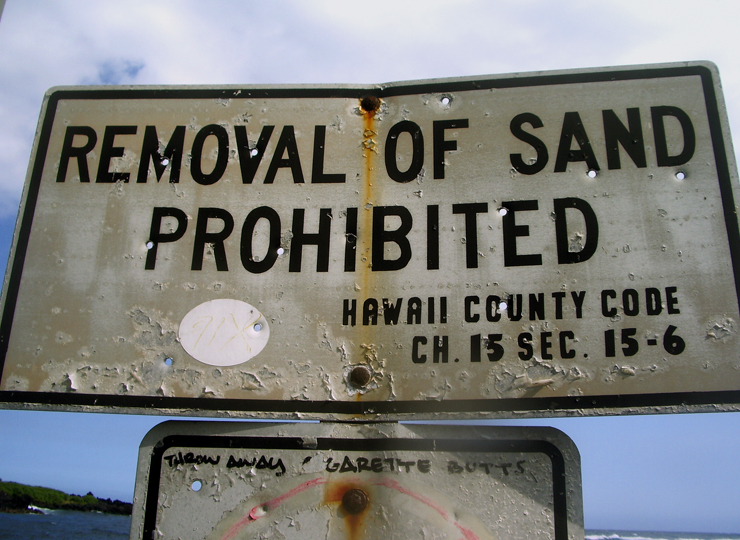 Don’t be seduced into rinsing off here—it is bottomed by foul-smelling quicksand and is extremely nasty if you jump in. 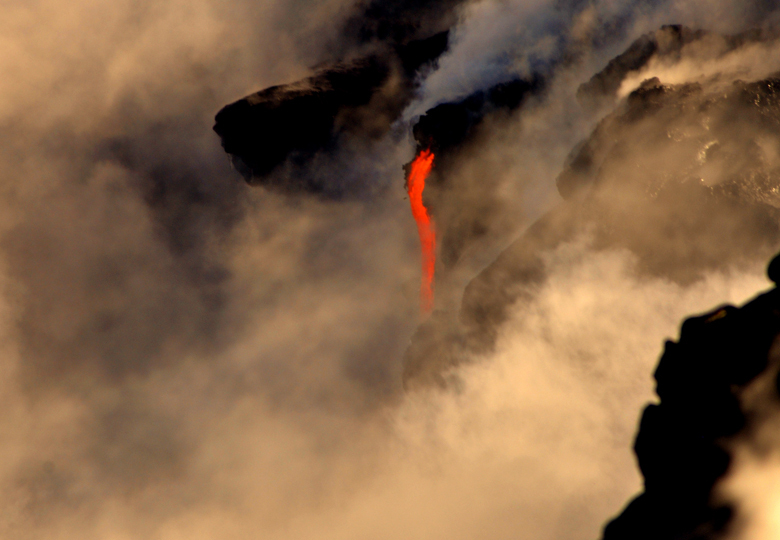 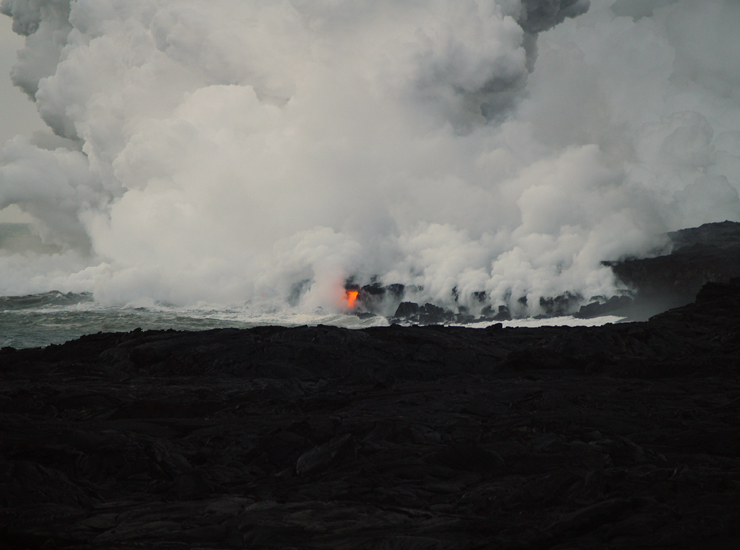 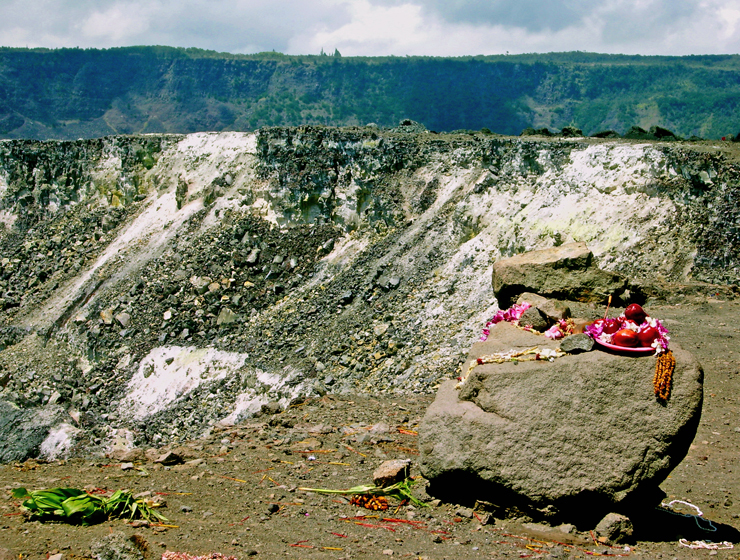 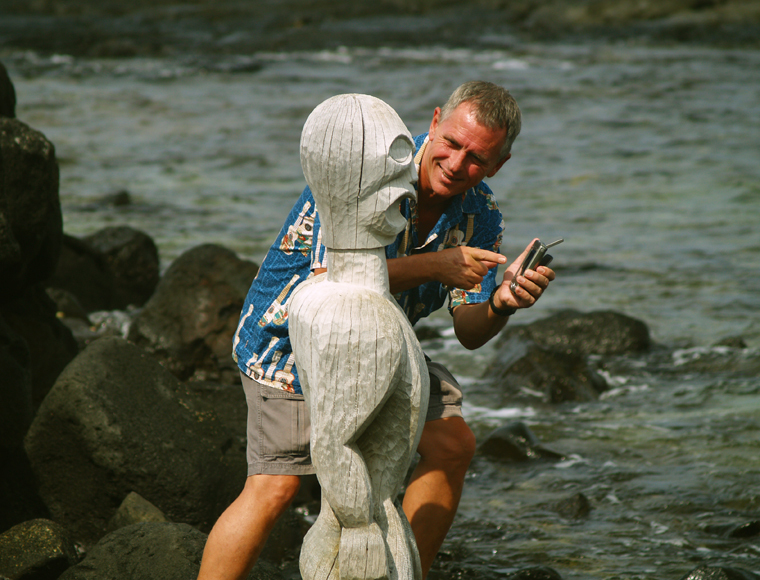 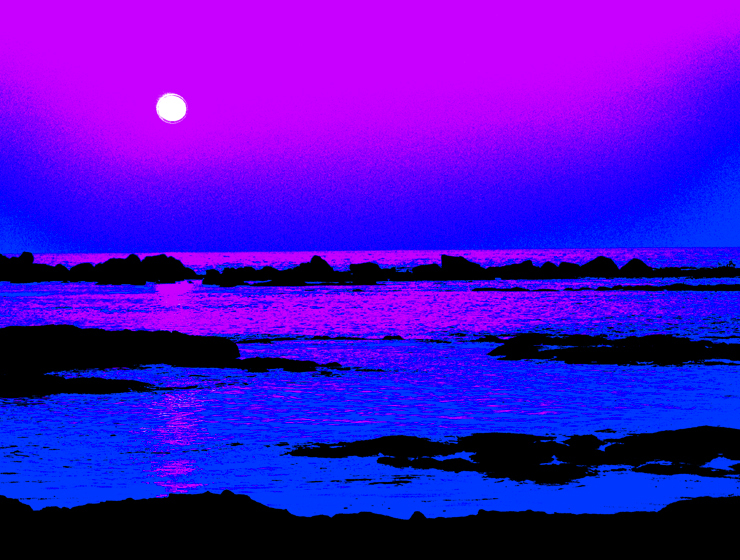 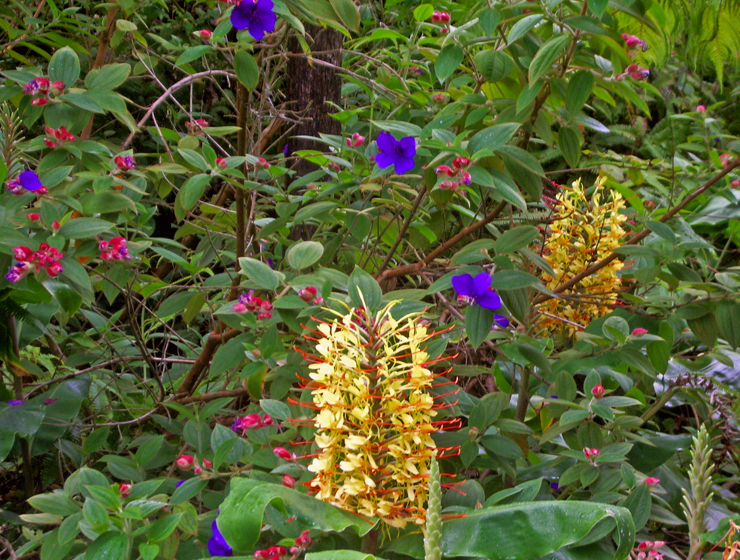 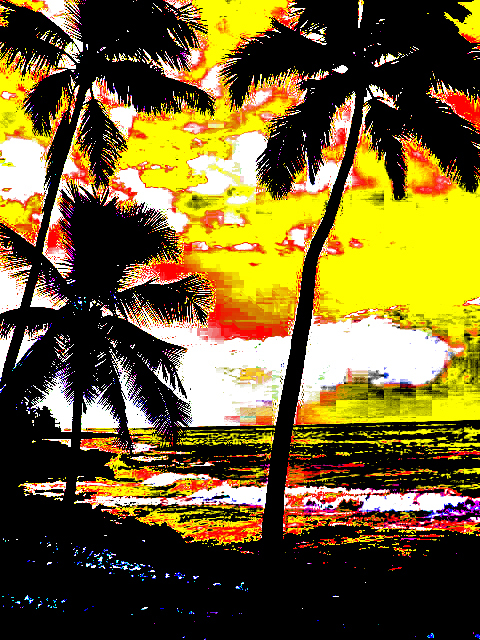 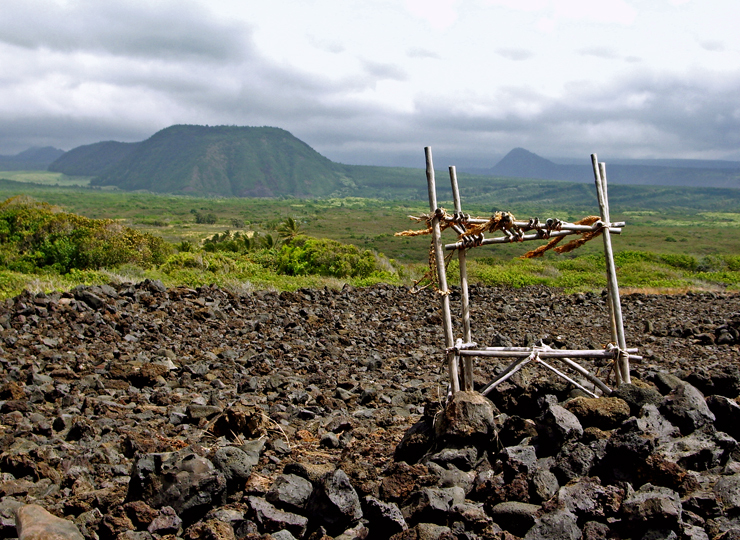 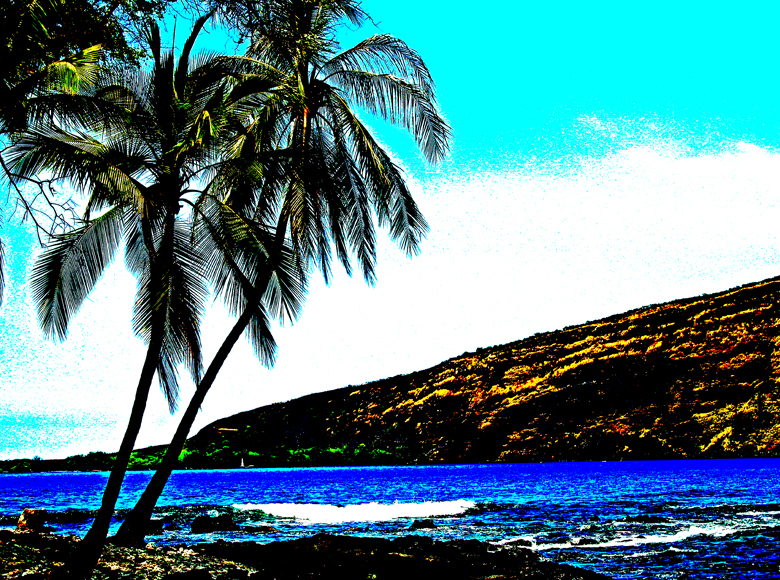 There are sacred, native Hawai’ian sites and ruins to the north of the beach; please do not disturb them. 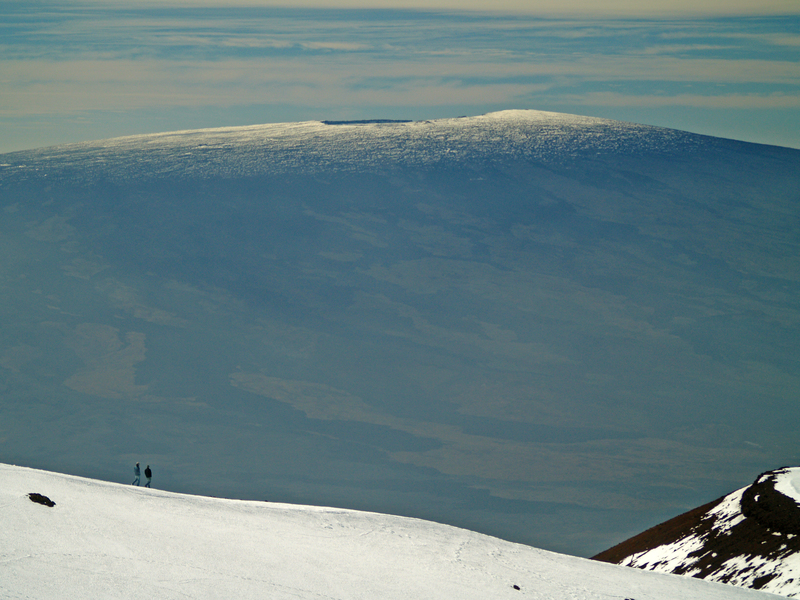 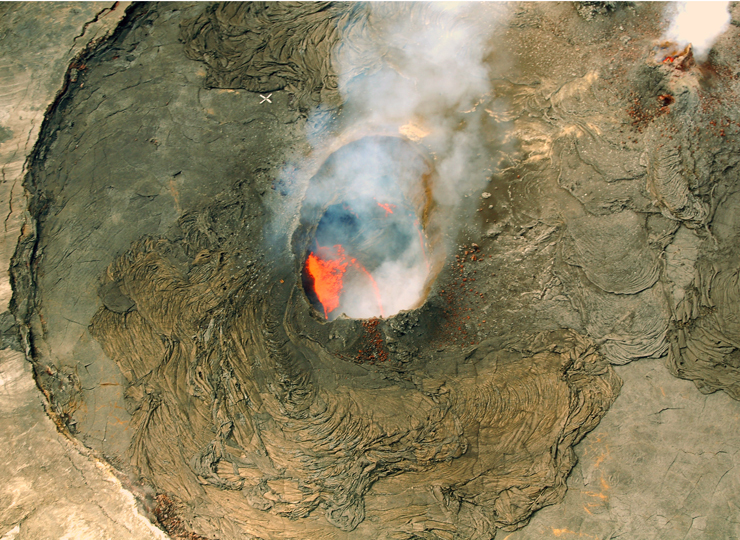 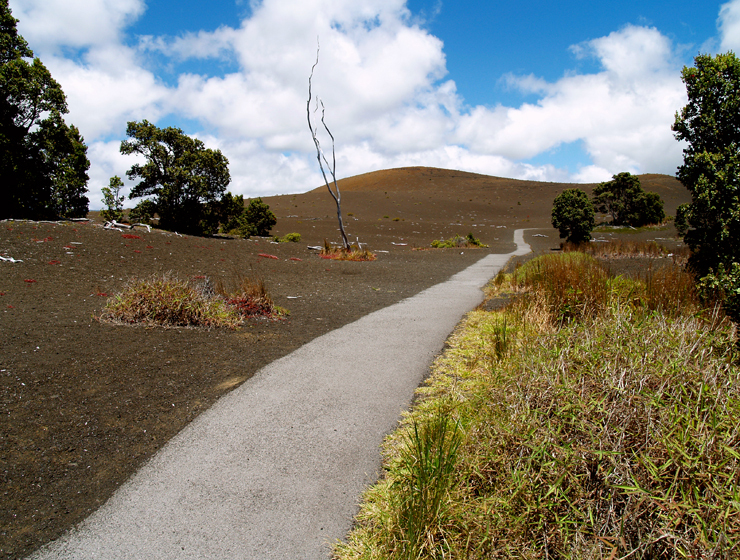 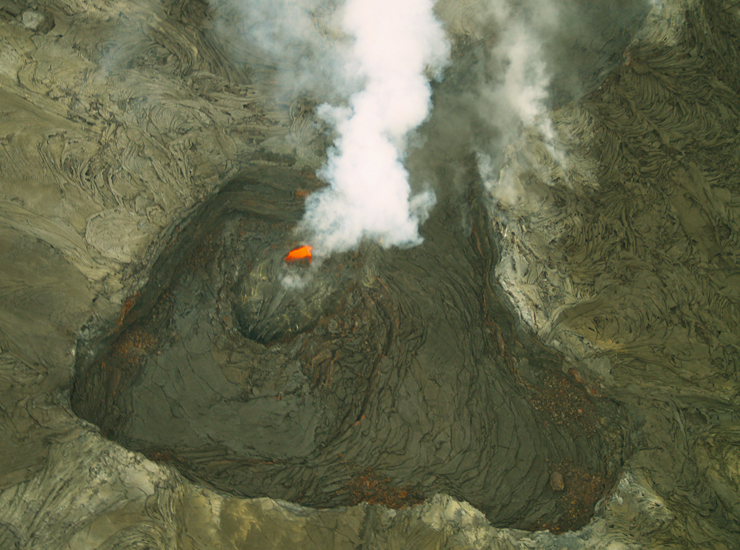 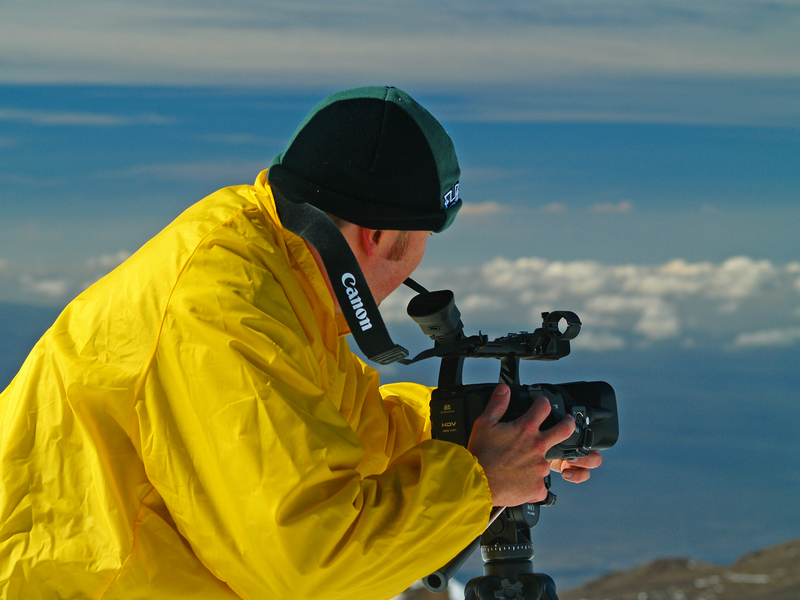 A short hike from the access road brings one to the summit of Pu’u Ku’ili, a 342-foot high cinder cone. 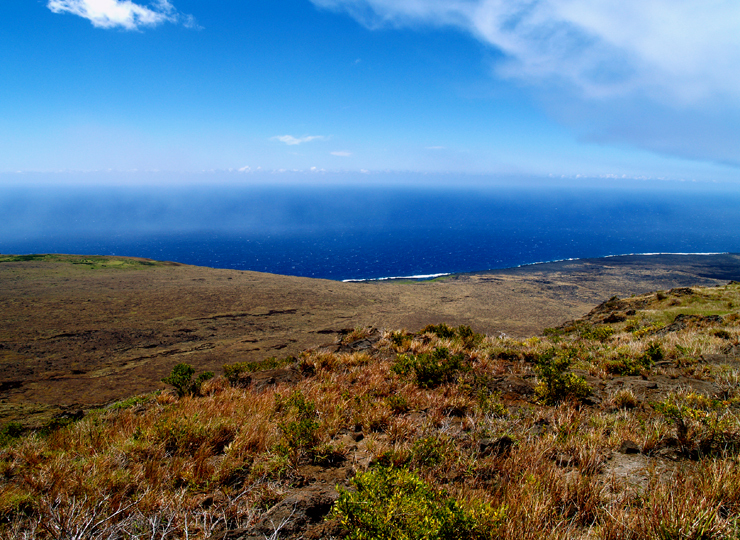 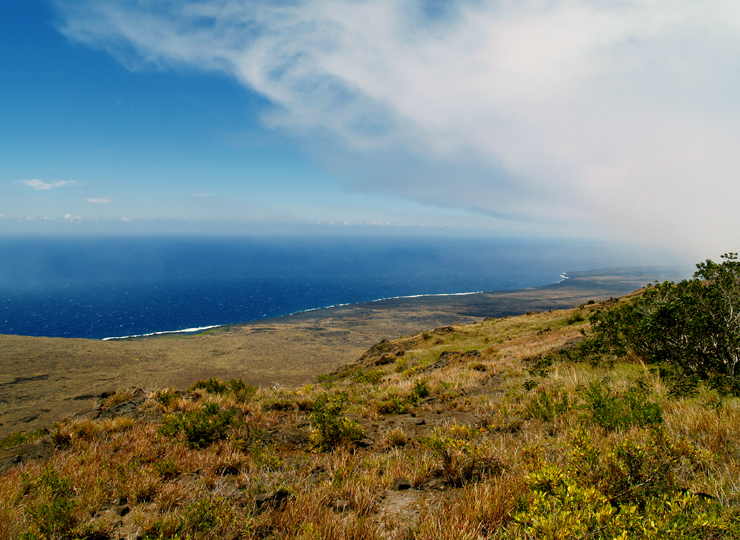 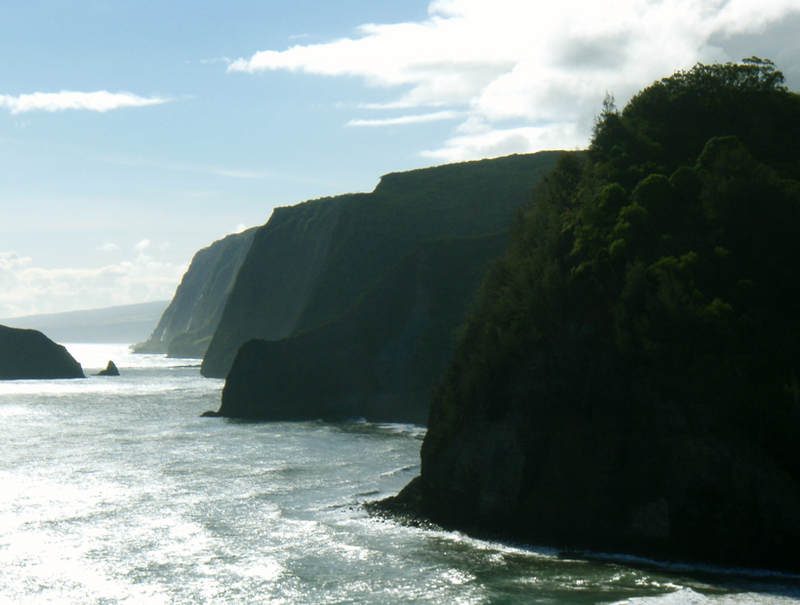 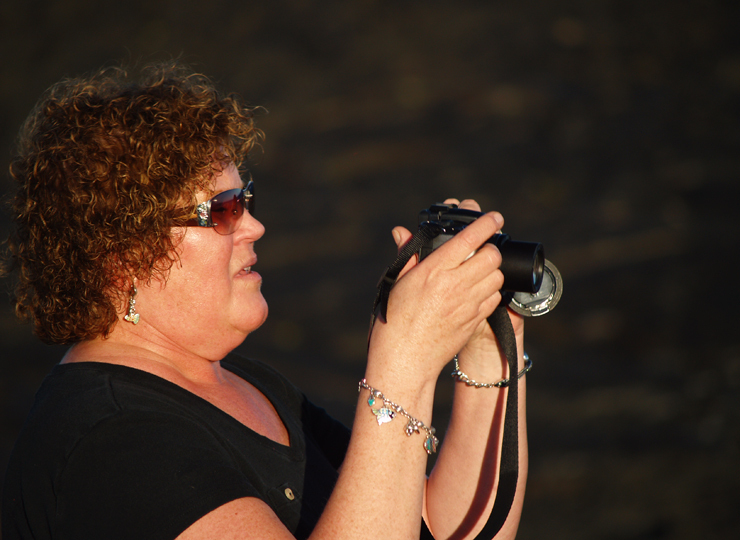 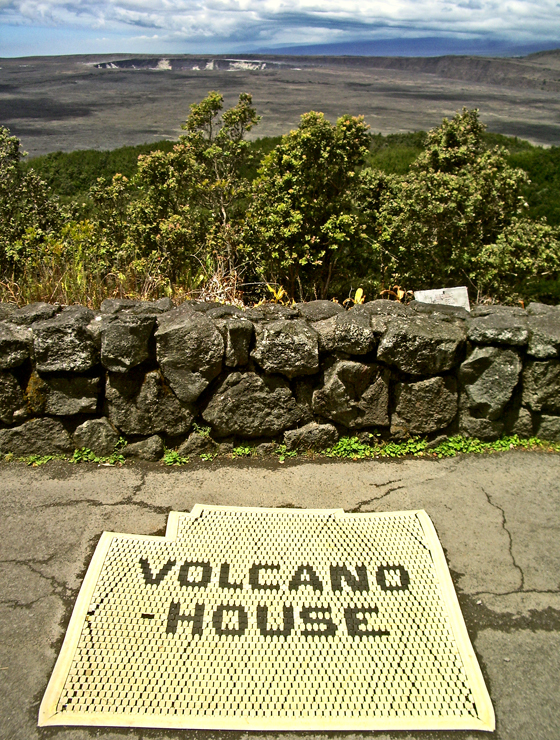 A romantic spot to watch sunsets and whales, it boasts a majestic view of the Kohala coastline. 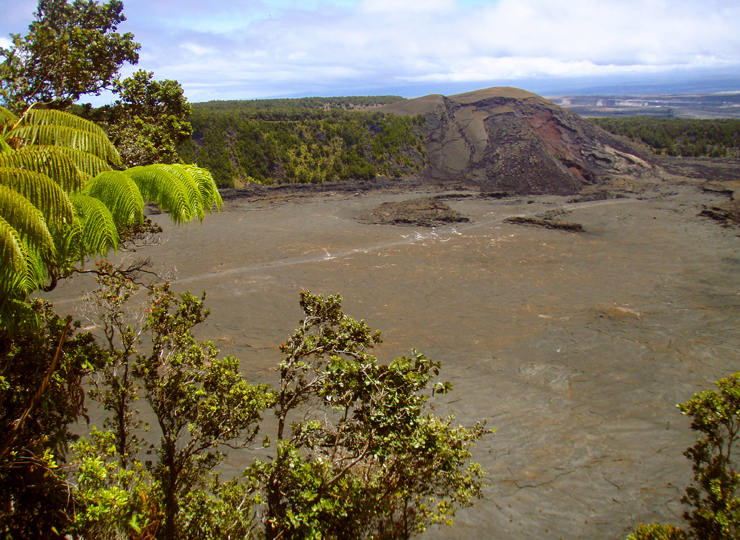 As of this writing, mountain biking along the trail up Pu’u Ku’ili is tolerated by the state Department of Land and Natural Resources. 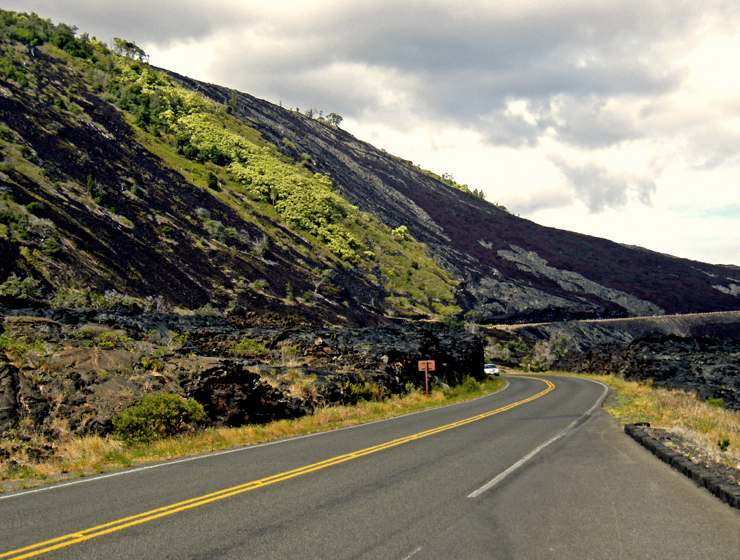 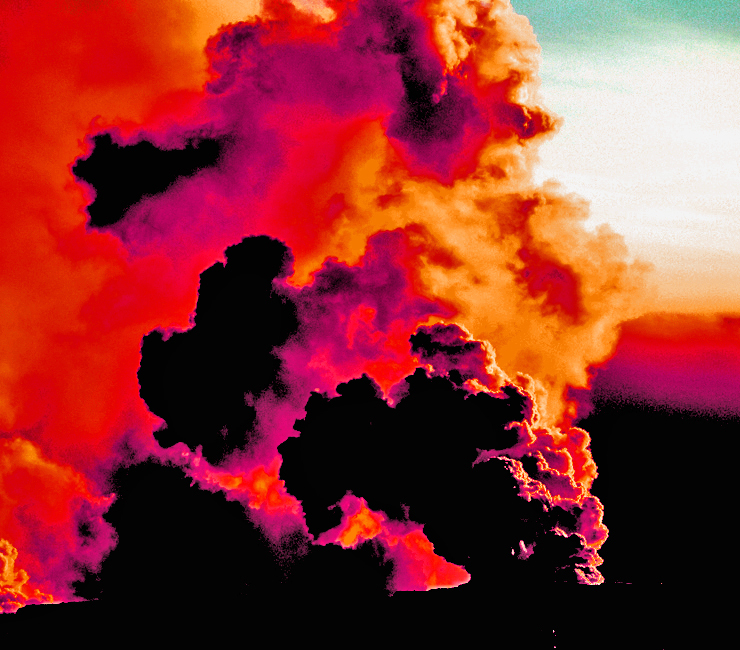 The ride up is short but sweaty, but the blast down is well worth the effort. 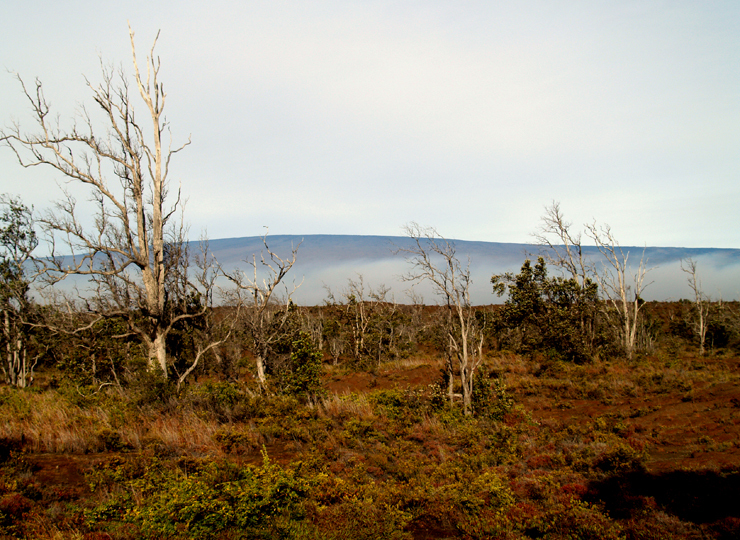 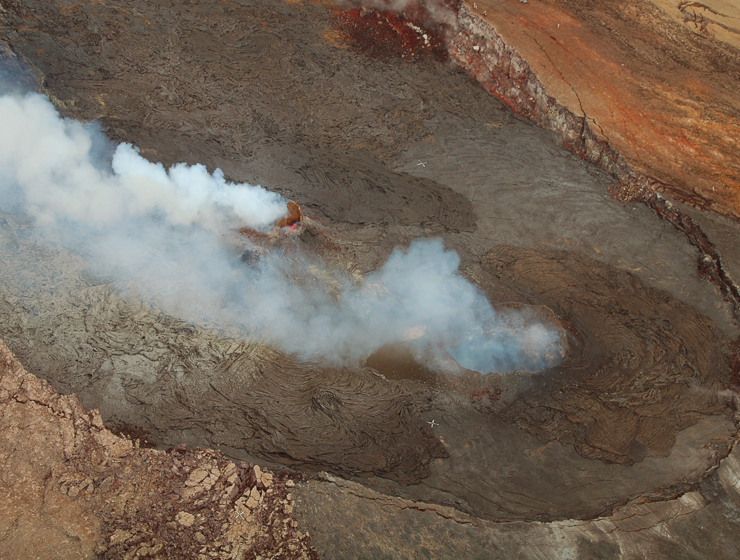 However, one must be careful to stay on the trail and be wary of tearing up the fragile plants; the erosion which inevitably follows such abuse will quickly ruin this wonderful little pu’u. 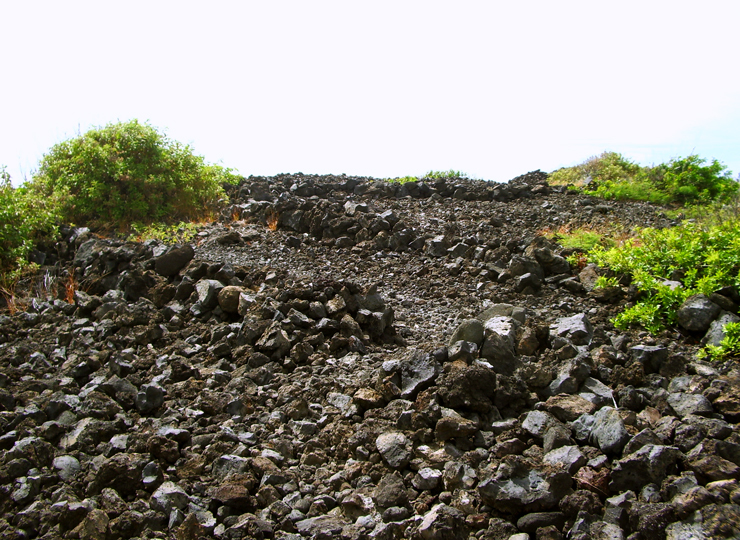 Because of the actions of some inconsiderate, ignorant and careless mountain bikers and off-road motor-bikers, access to riding this cinder cone may shortly be curtailed—so please be mindful of this when riding the trails. 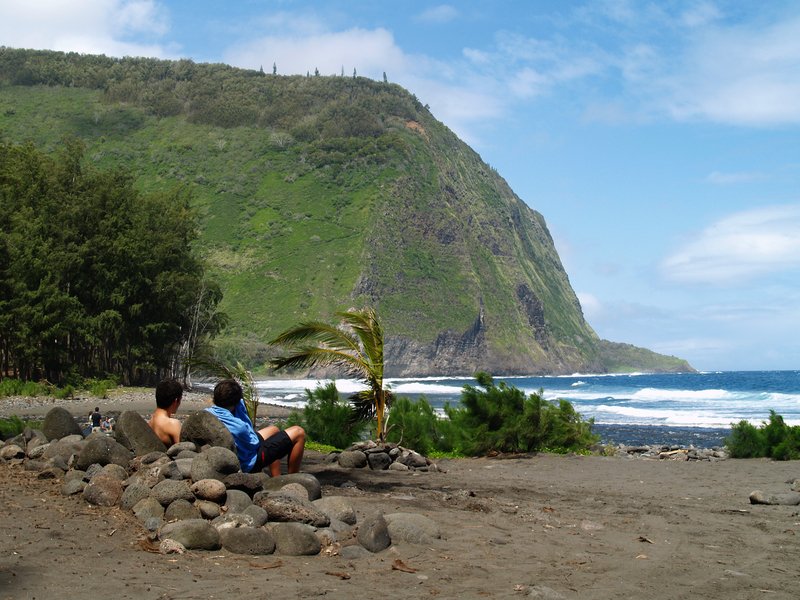 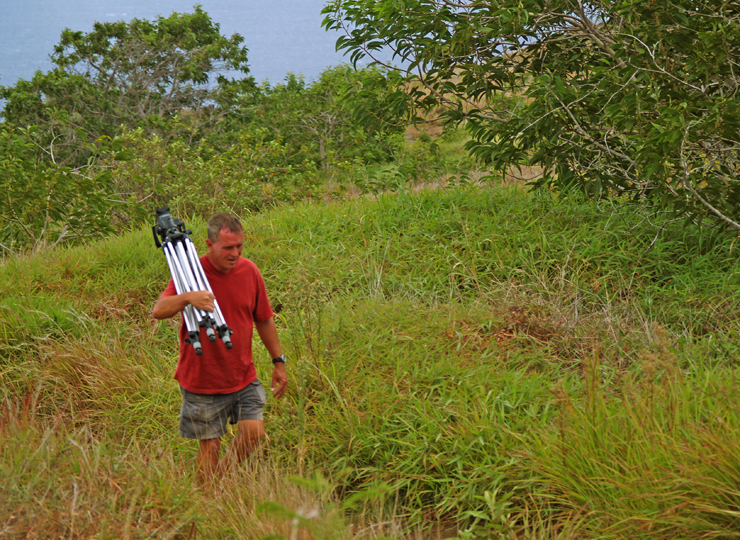 It is possible to hike along the shoreline Ala Ali’i (Way of the Kings) to Makalawena Beach, just to the south. 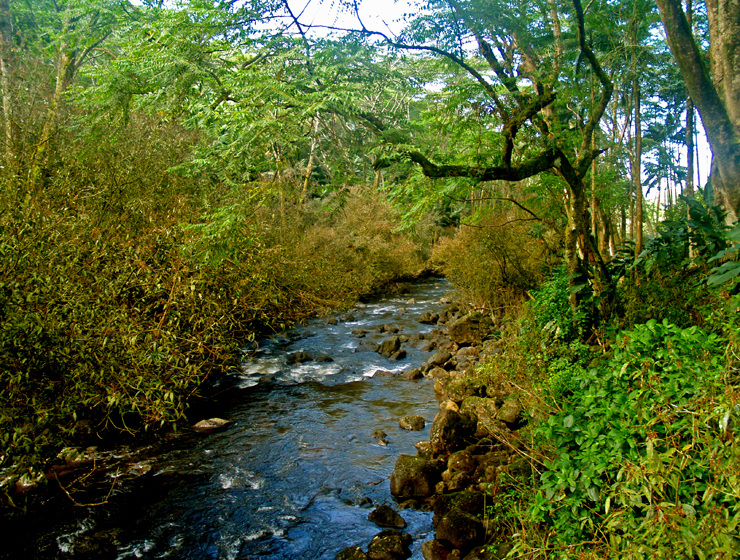 The hike is enjoyable and takes about an hour and half, but there is no potable fresh water for drinking or rinsing off with along the way. 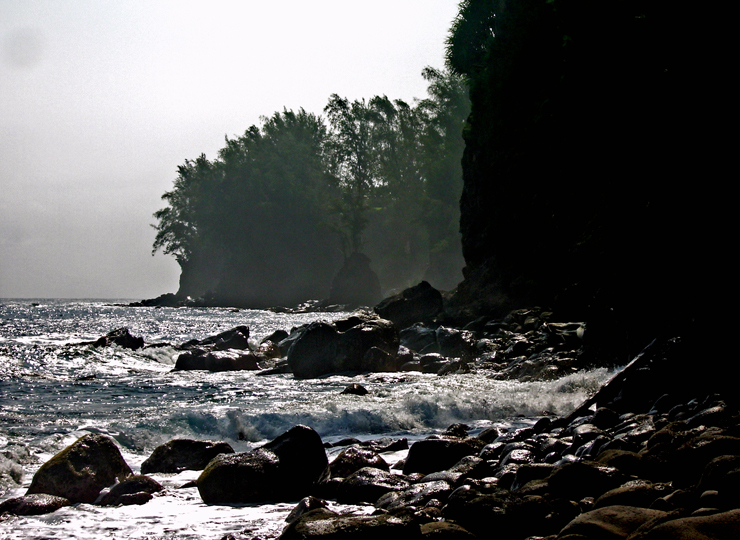 About half-way along this hike is a marvelous cove which makes for a remarkably isolated camp. 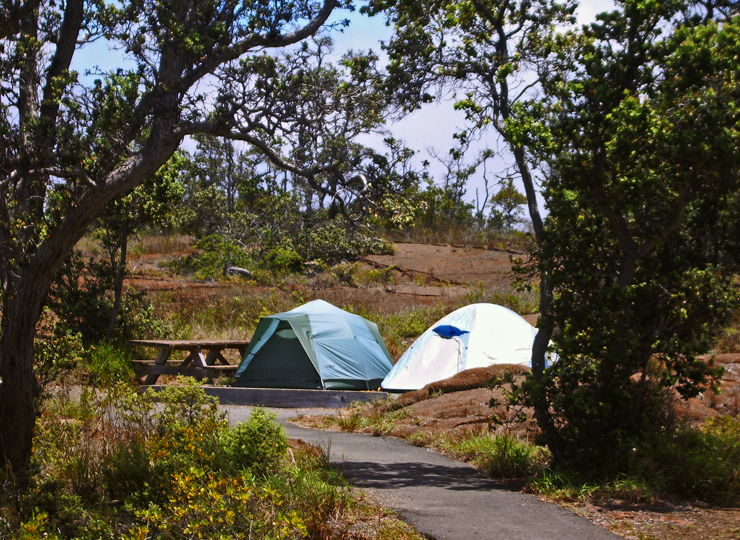 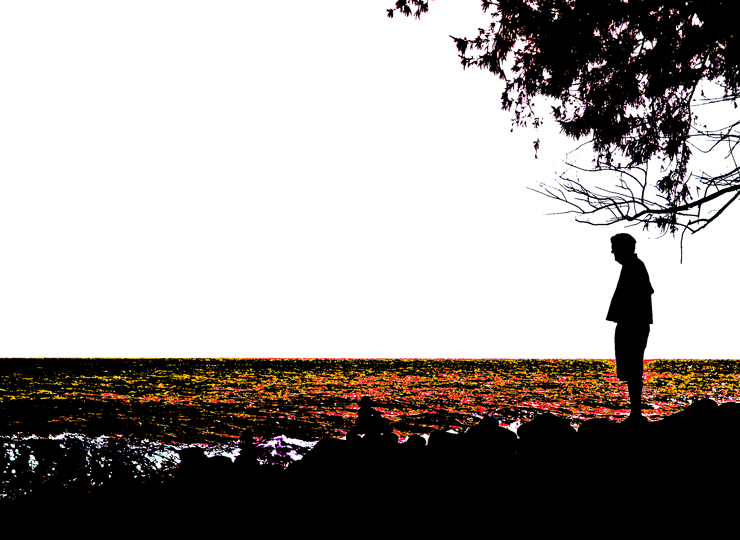 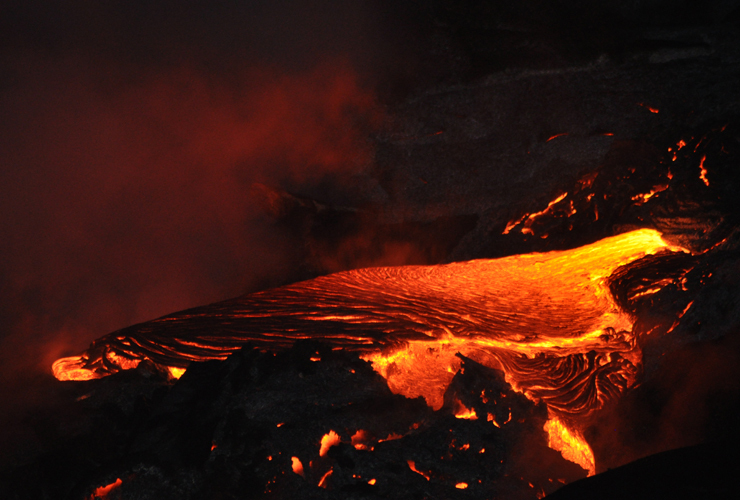 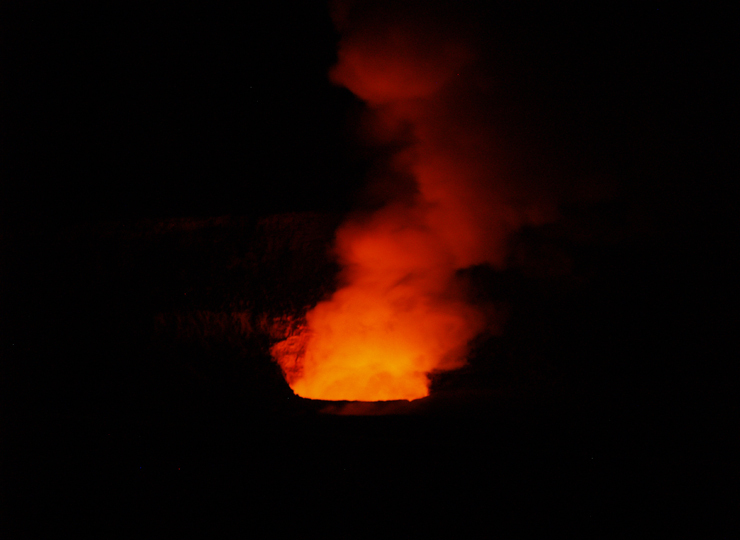 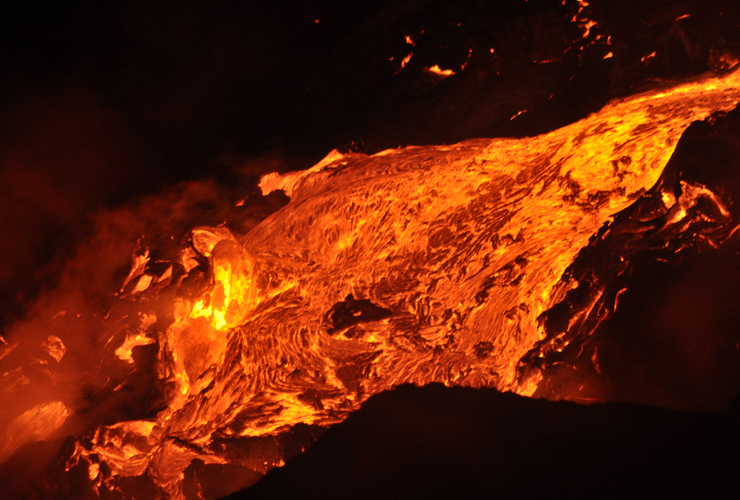 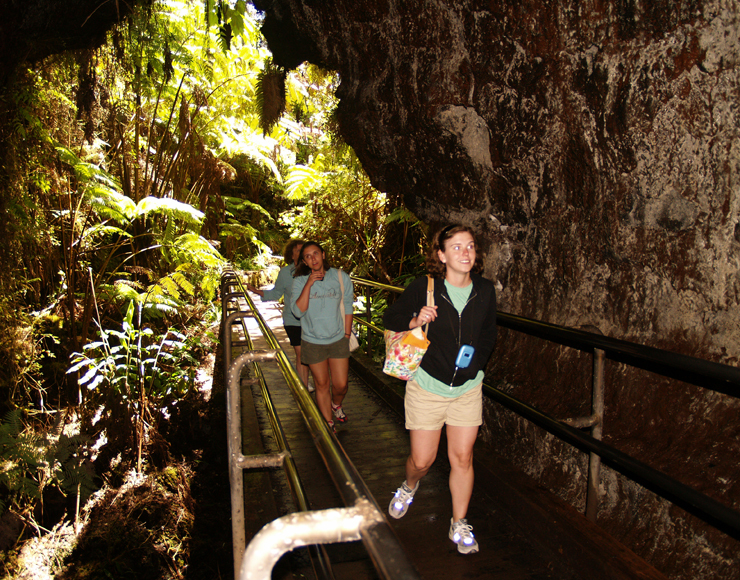 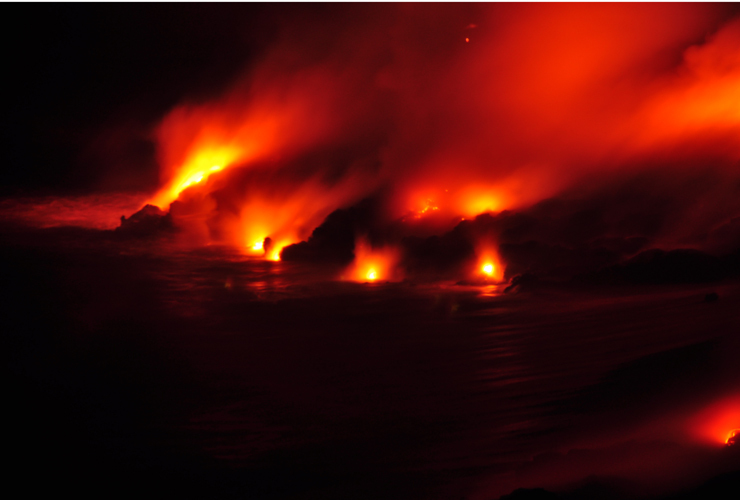 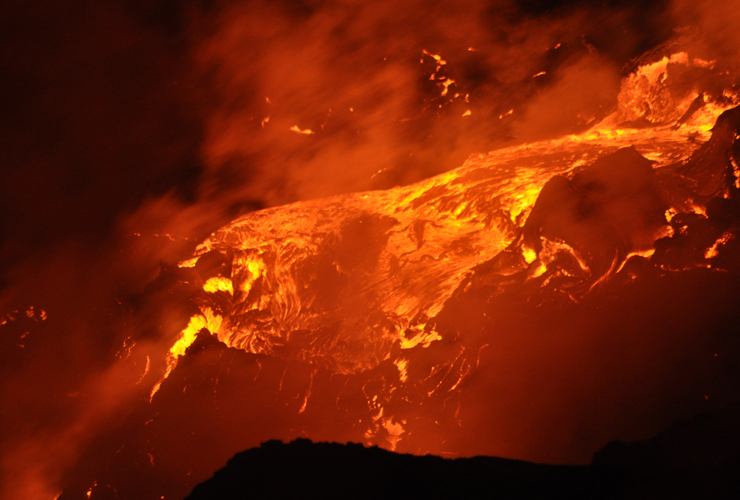 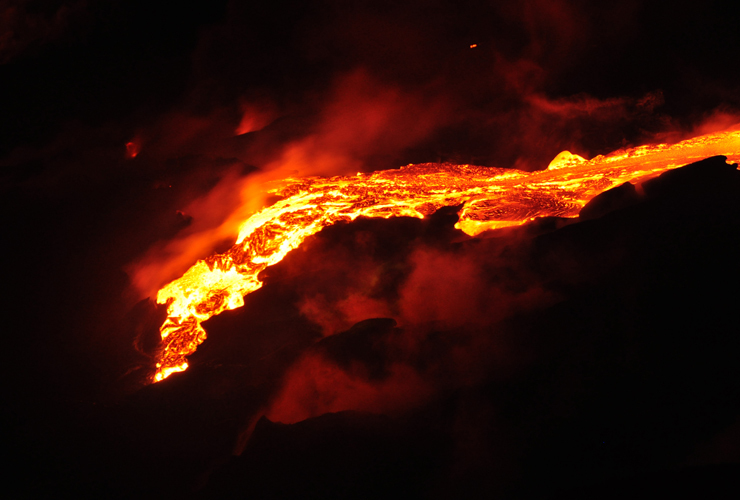 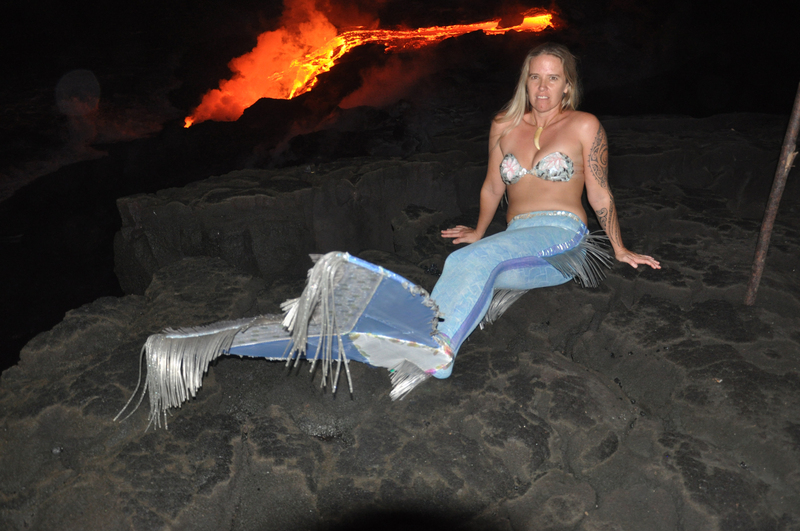 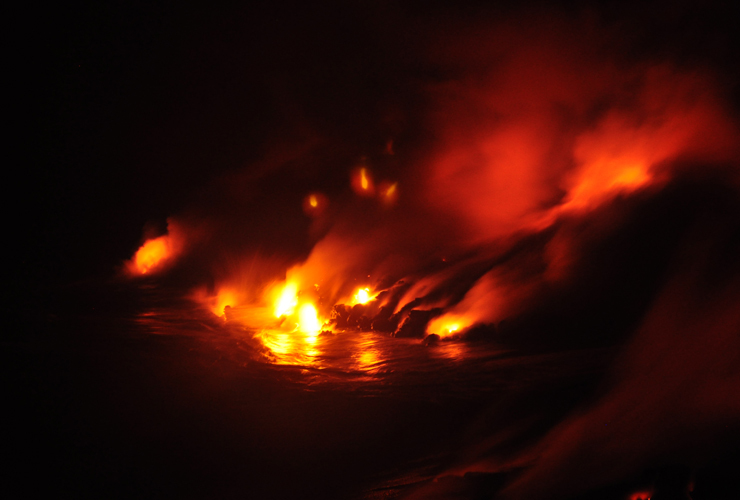 However, be sure you are prepared for any eventuality, to hike to the road either at Kua Bay or the main Kekaha Kai State Park facilities is rough and tortuous in the dark. 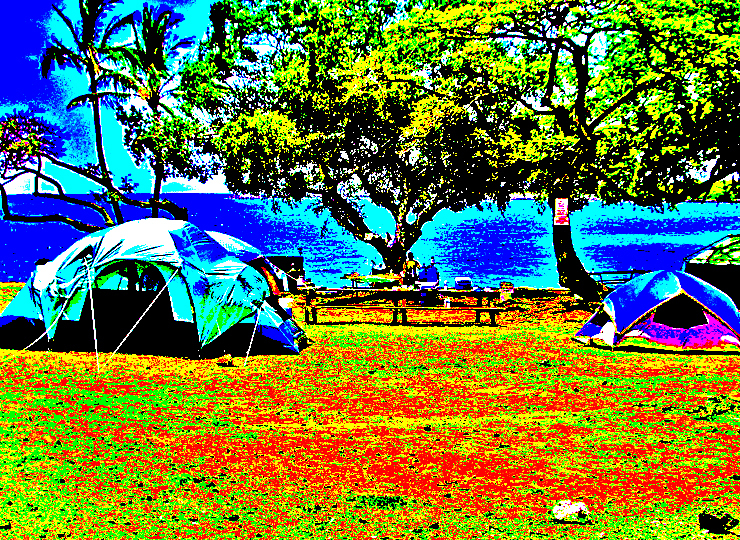 Read more about camping in this area, here. 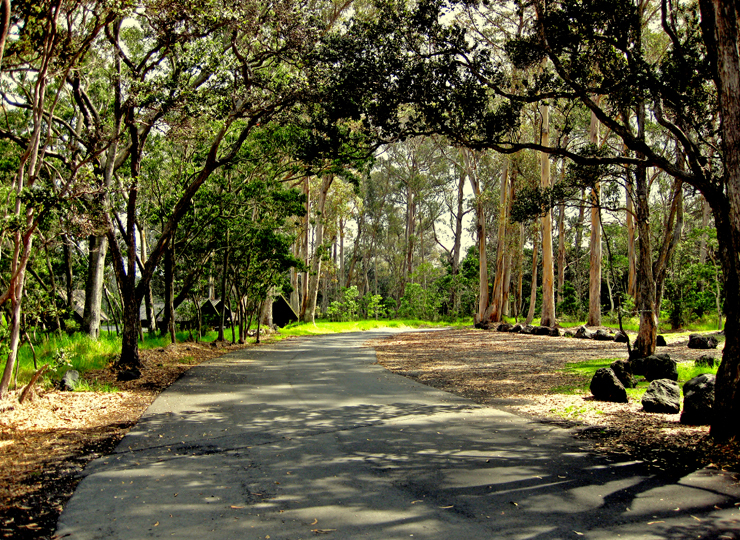 Access to Kua Bay is via a road so newly paved road it’s on few maps or GPS databases. 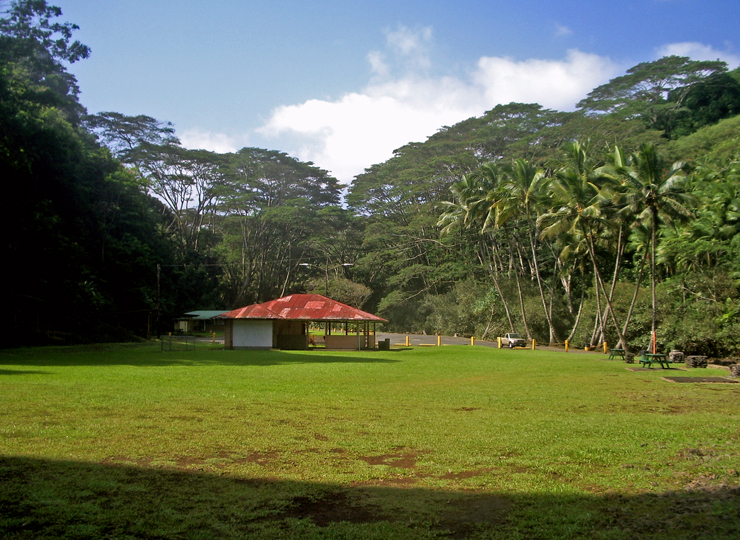 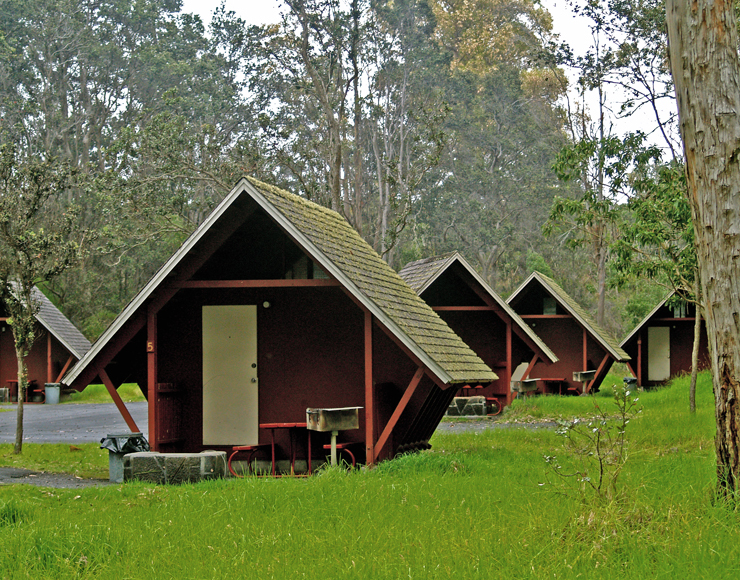 Park facilities include parking, picnic tables, restrooms and water. 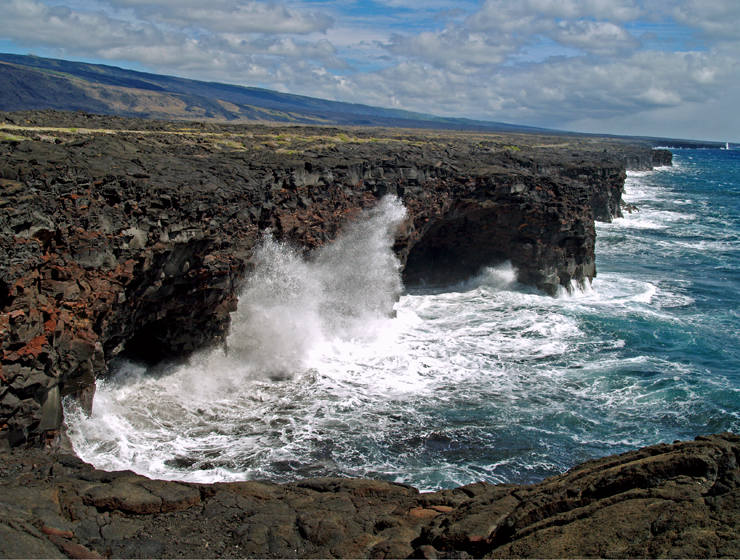 Wild goats are frequently seen in this area as are dolphin, turtles and whales in season. 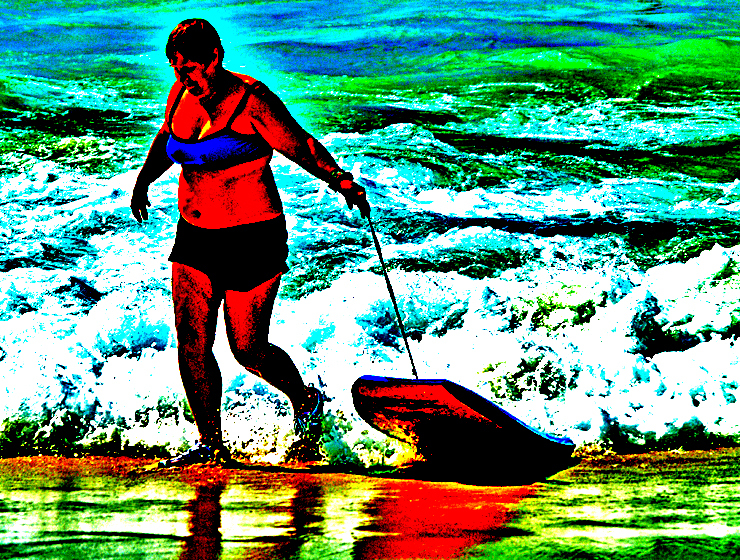 Remember there is no lifeguard. 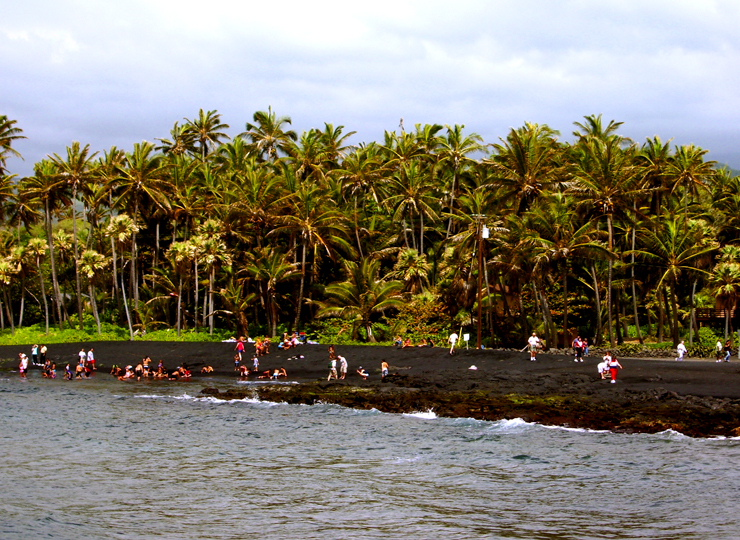 A lovely black sand beach with an expert surf break, Isaac Hale Beach Park is one of the very few real beaches and boat ramps in Puna District; as such this park sees a lot of traffic. 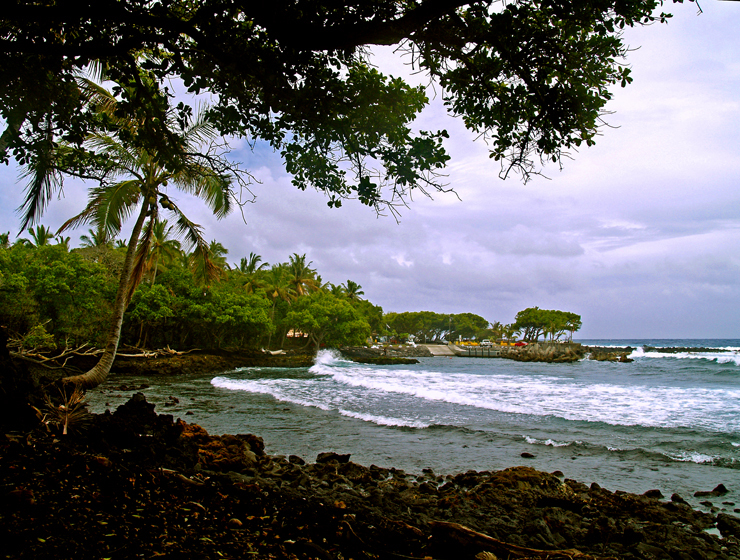 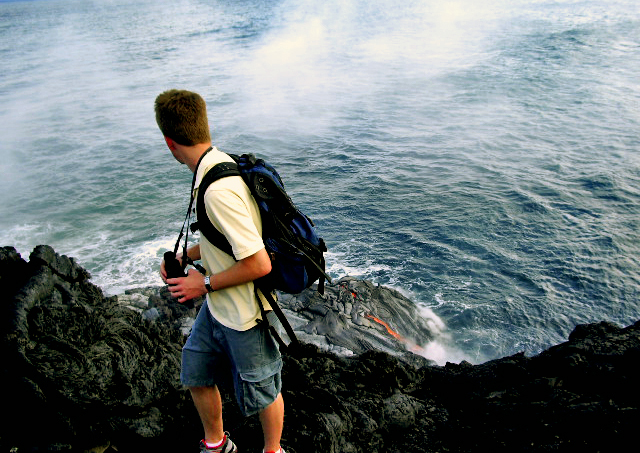 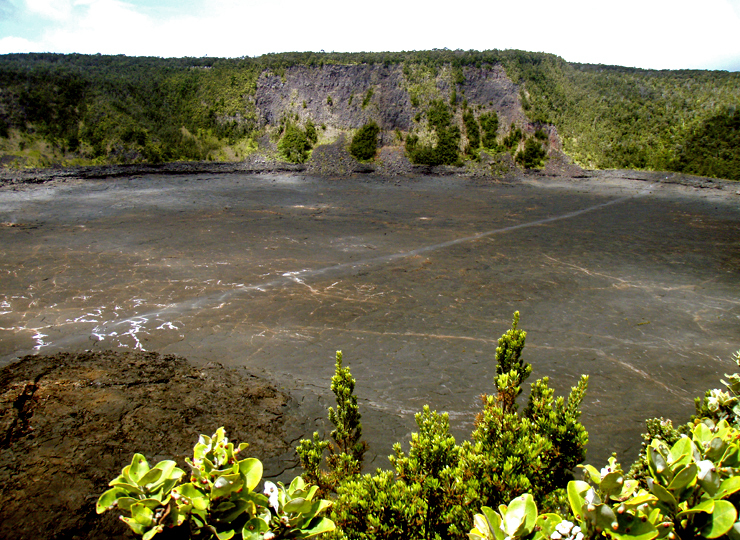 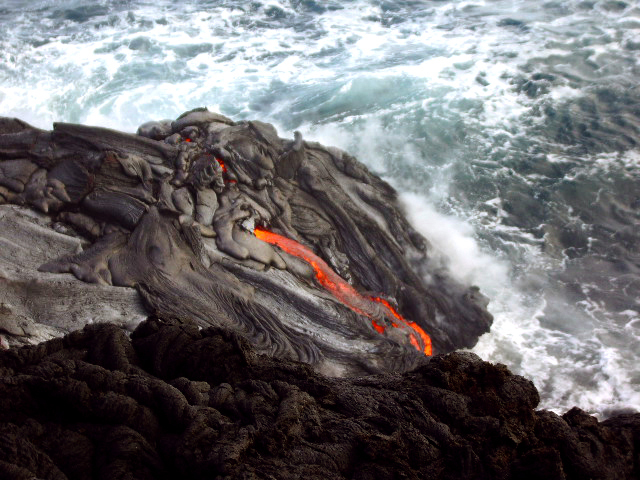 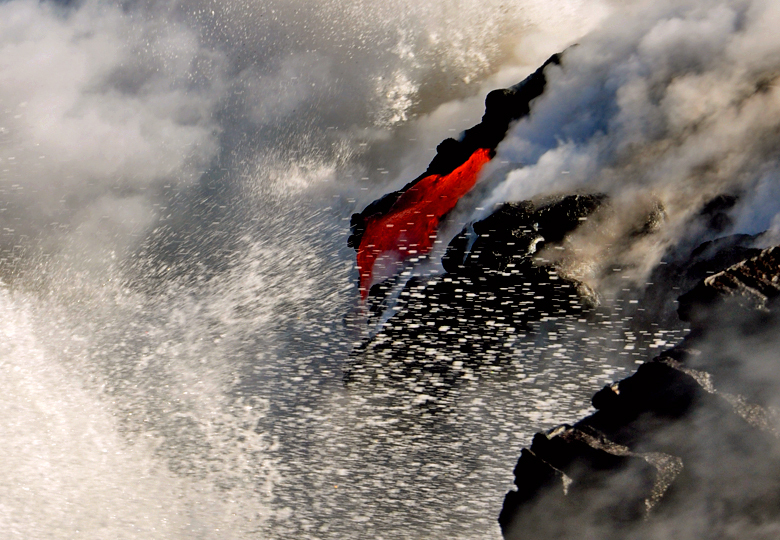 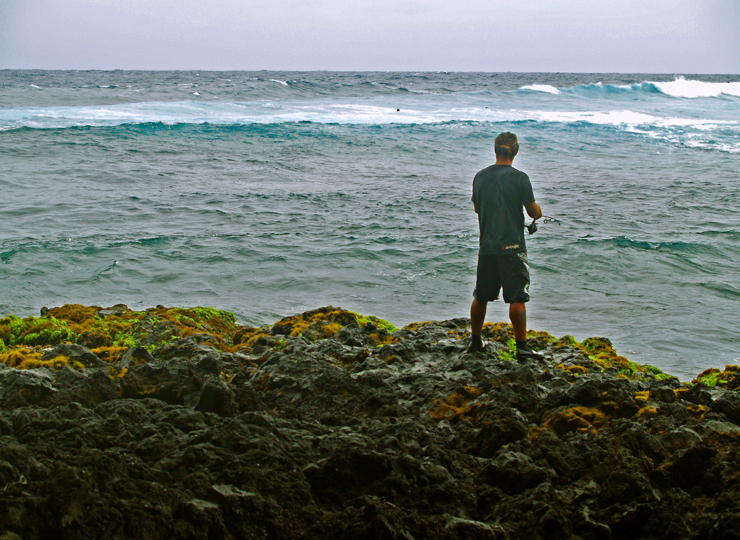 It is also the site of the best surfing and some of the wildest snorkeling and scuba diving in Puna. 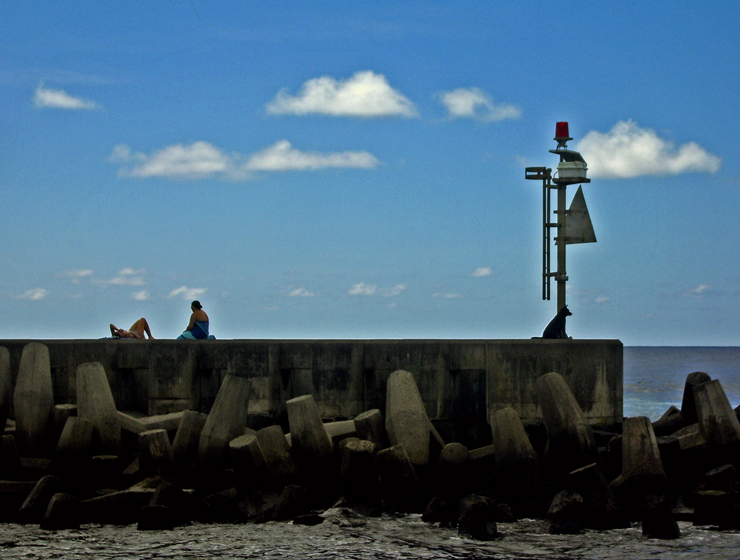 If you do get in the ocean here, go in left of the boat ramp—be alert to bodacious boat traffic (they won’t be alert for you) and for fairly dangerous ocean currents. 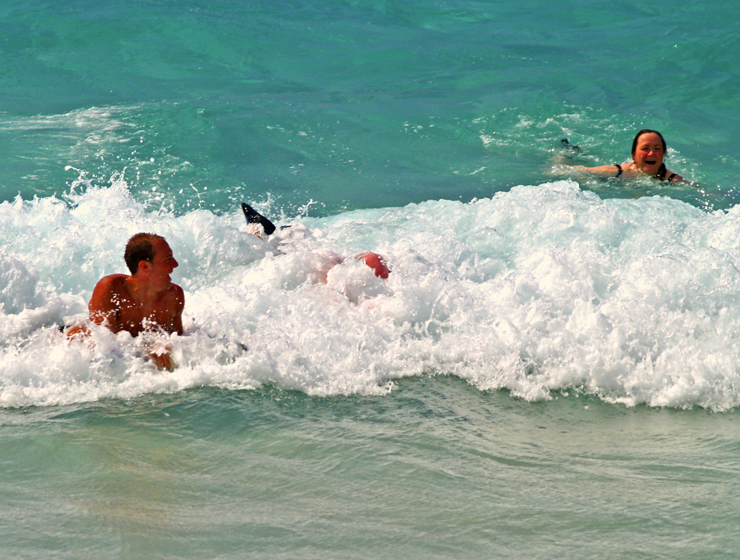 If there is any wind or surf, do not swim in the ocean, it can get hairy. 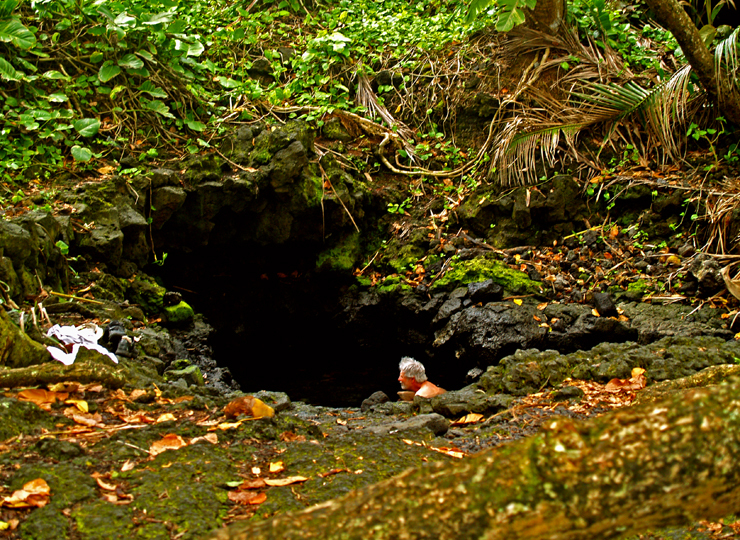 Understandably, given the crowded nature of this small place, some locals are less than welcoming of visitors. 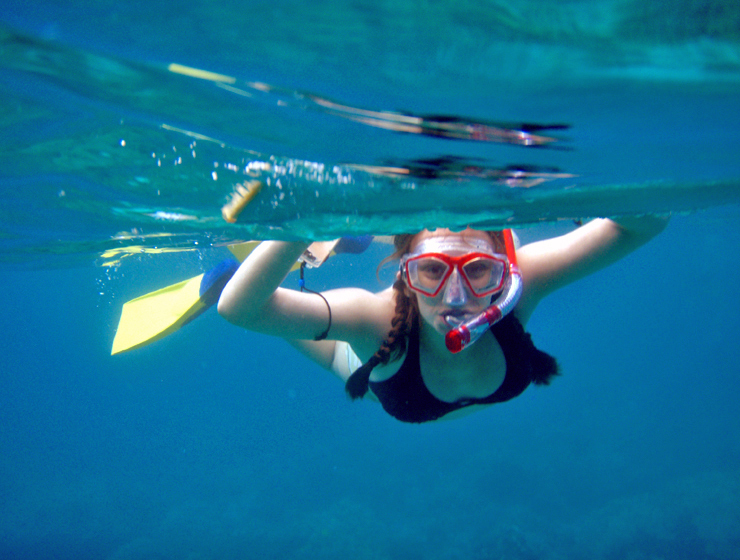 Graciously share this ocean treasure with the residents, but leave no valuables in your car. 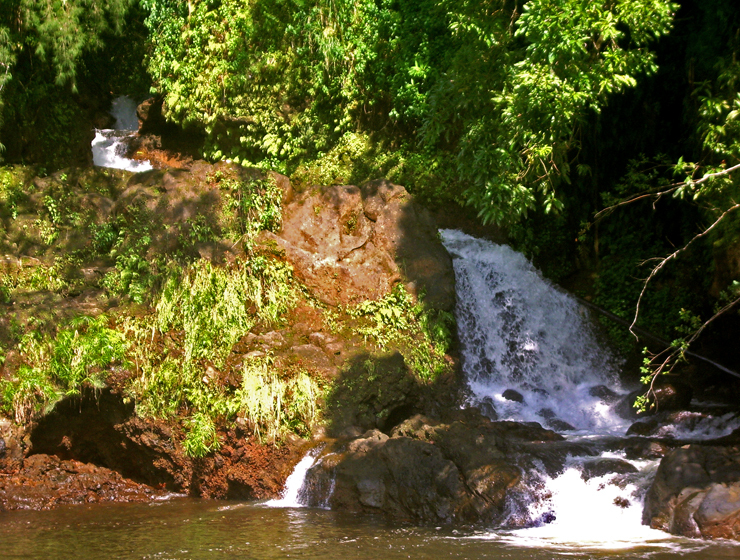 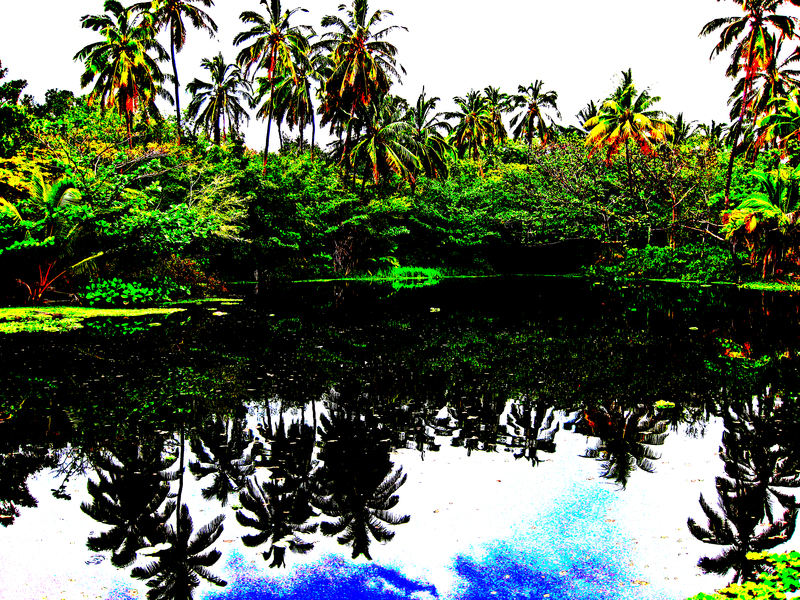 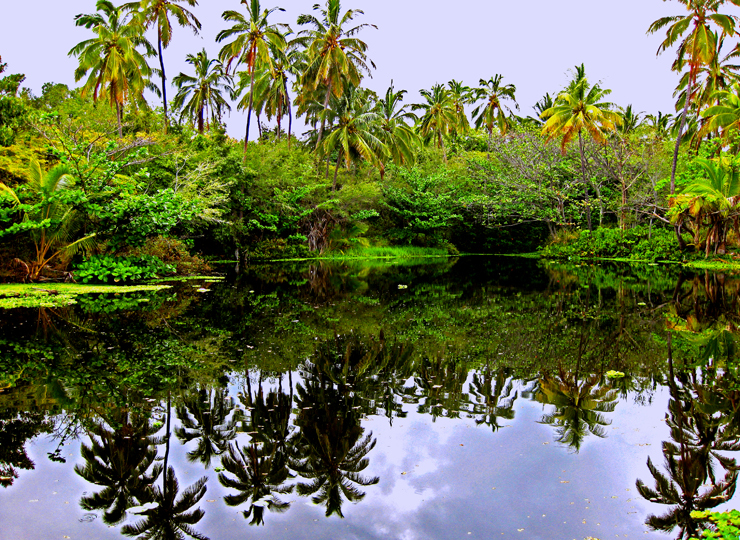 A short path along the shoreline leads from the parking lot, past a house with abundant “No Trespassing” signs, just a few minutes stroll then turns about 20 yards into the jungle to a secluded, perfectly lovely natural hot spring that is wonderful for soaking. 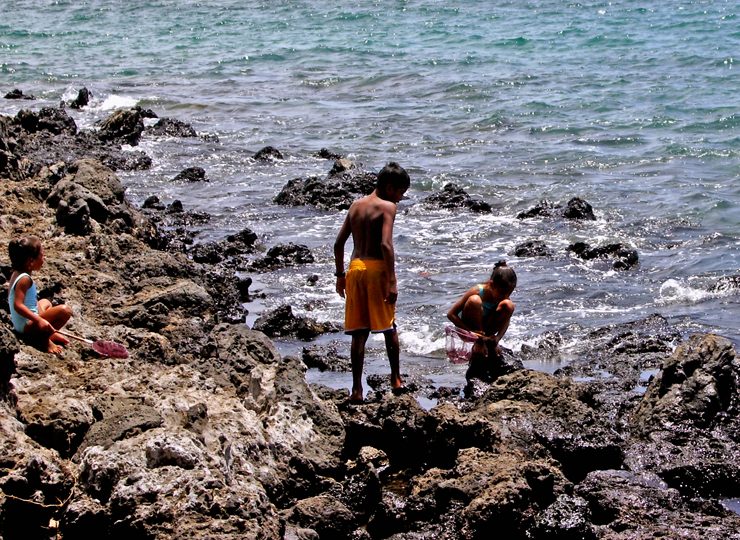 Locals usually don’t bother with swimwear here; you shouldn’t feel required to, either. 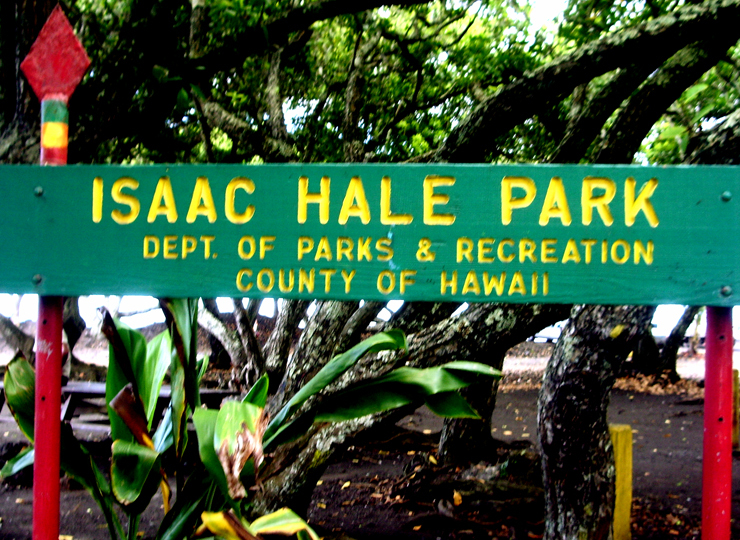 The facilities at Isaac Hale Park have just been revamped and updated and include handicap-access paved trails, new picnic facilities, life guard towers showers and restrooms. 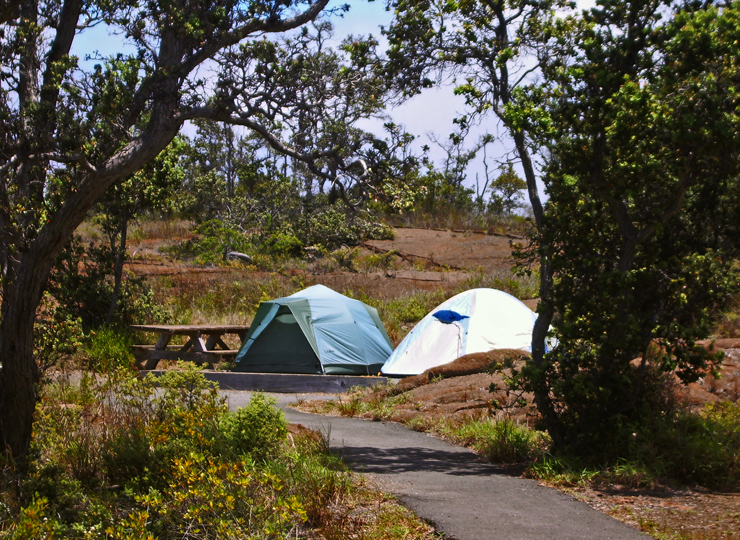 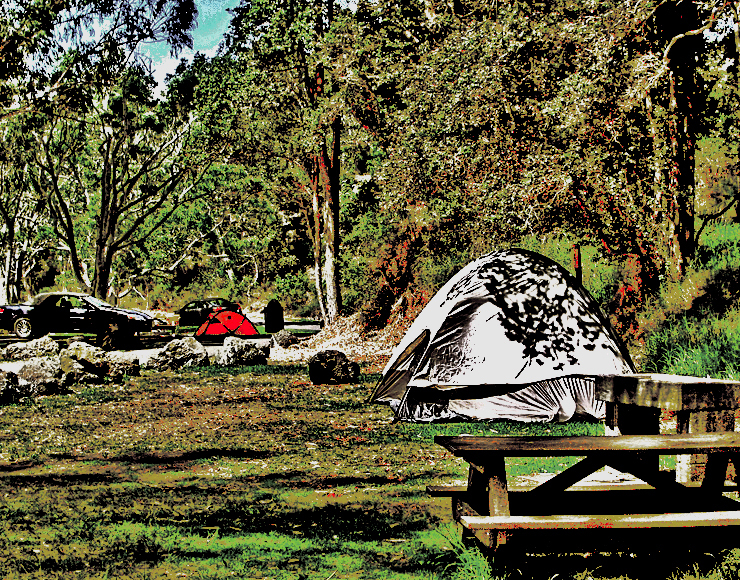 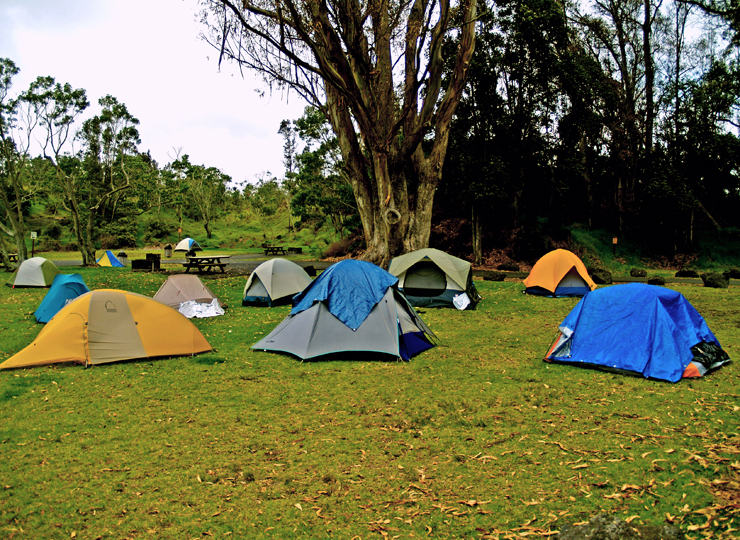 Camping is allowed with a County permit, but due to lack of security, it is not advised.